This is possibly the most beautiful park I’ve ever been too and I hope you’ll agree as this park has won many international awards for its landscaping. This park is very well shaded with many large and tall trees throughout the park, It is so well shaded that it feels at least ten degrees cooler in this area than the surrounding communities, however you’ll need to bring a comfortable pair of tennis shies as it is pretty hilly here especially if you want to go down to the Rhine River Cruises or see the famous interlocking loops on the Loch Ness Monster roller coaster. 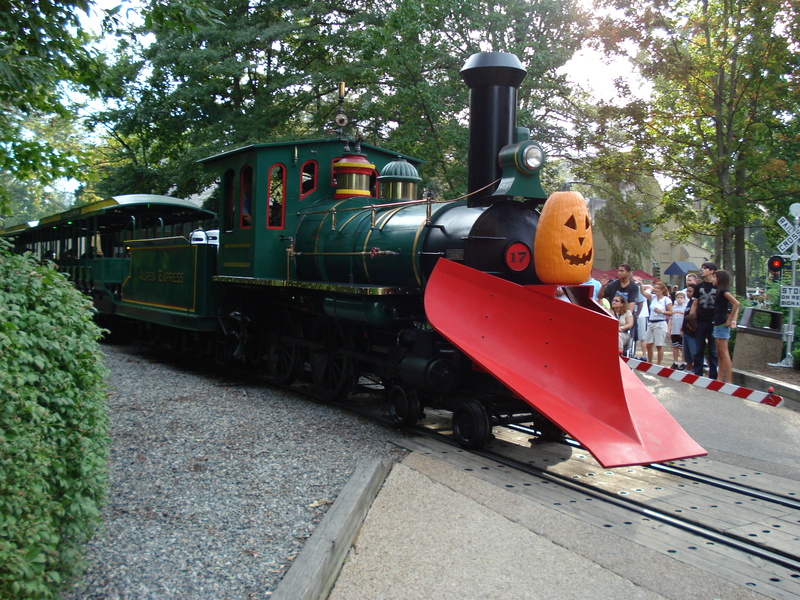 Busch Gardens Williamsburg is located in historic Williamsburg, VA, USA, almost half way between Hampton and Richmond, the Capitol of Virginia. 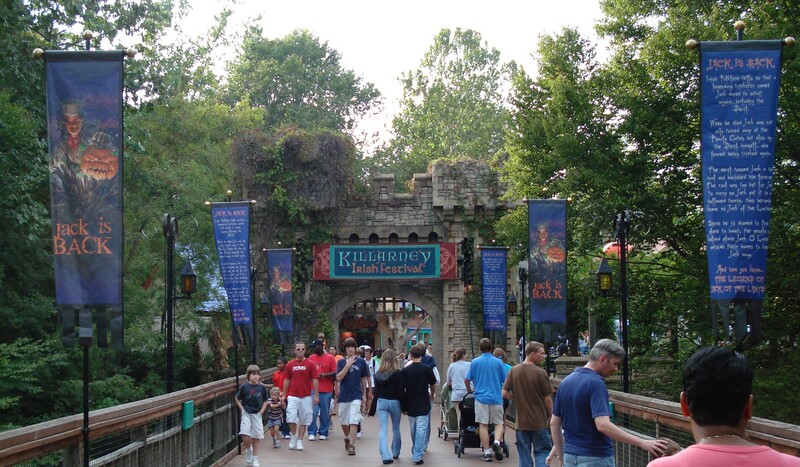 It opened on May 16, 1975 as Busch Gardens: The Old Country. 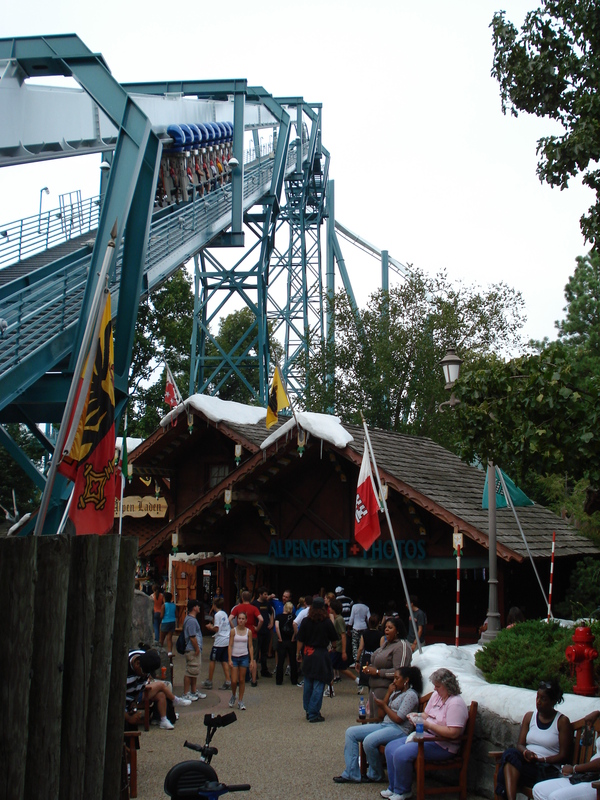 It operated under that name from 1975 to 1992 when the name was slightly changed to Busch Gardens Williamsburg which lasted from 1993 to 2005. 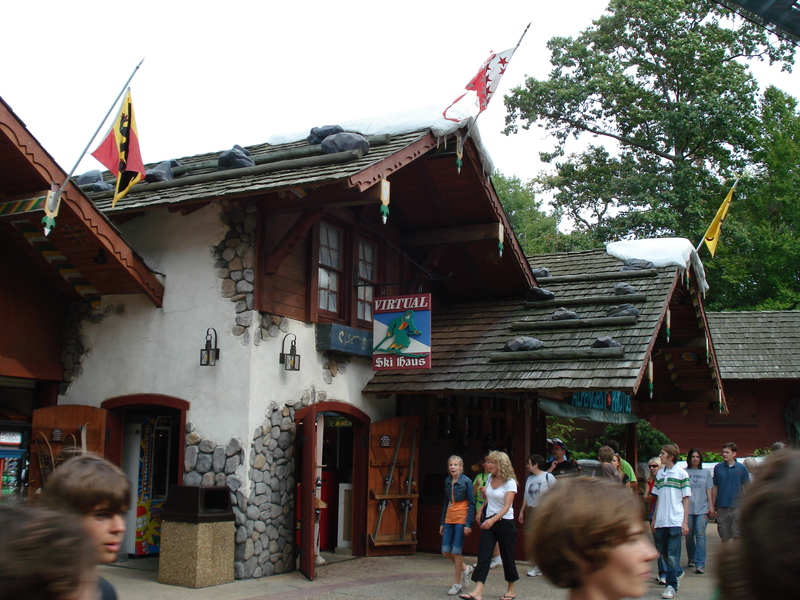 From 2006-2008, It changed slightly again to Busch Gardens Europe and then reverted to Busch Gardens Williamsburg from 2008 to the present day. 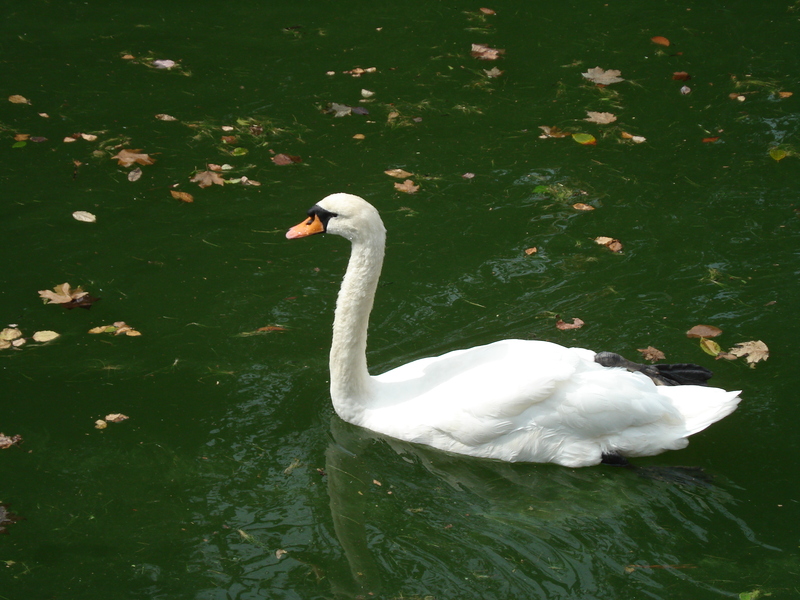 Here are some photos of some of the Geese that call the Rhine River home. 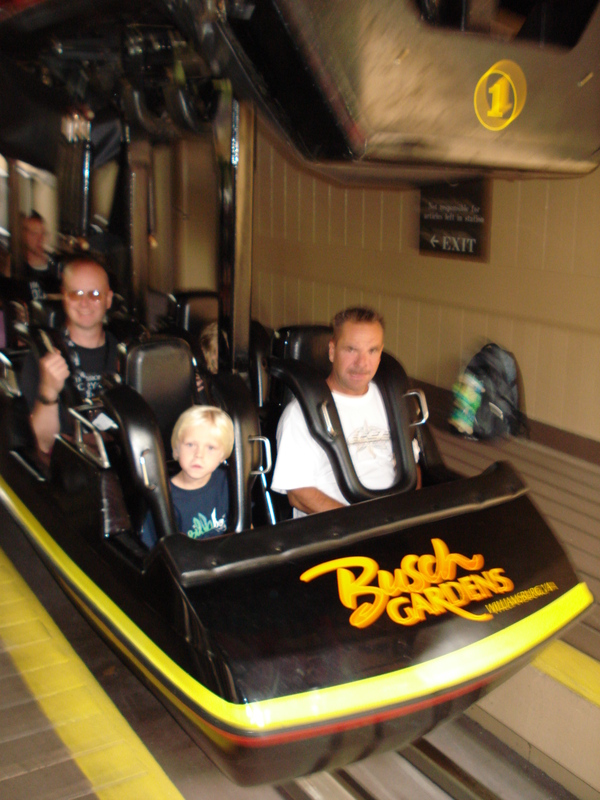 Busch Gardens Currently has eight themed areas and they are, (starting at the entrance and going counterclockwise around the park) Banbury Cross (England), Heatherdowns (Scotland), Killarney (Ireland), Aquitaine (France), New France, Oktoberfest (Germany), Rhinefeld (Germany), San Marco (Italy), Festa Italia (Italy), and Sesame Street Forest of Fun. We’ll start our journey off at the entrance in Banbury Cross (England). This area is mainly filled with shops to catch tourists as they’re entering and have just realized they forgot something and don’t want to go back to the hotel or house, and to catch people leaving to try to sell them just one or two more things they must have. There also is a 4D simulator here which was showing Pirates 4D when I was here last. 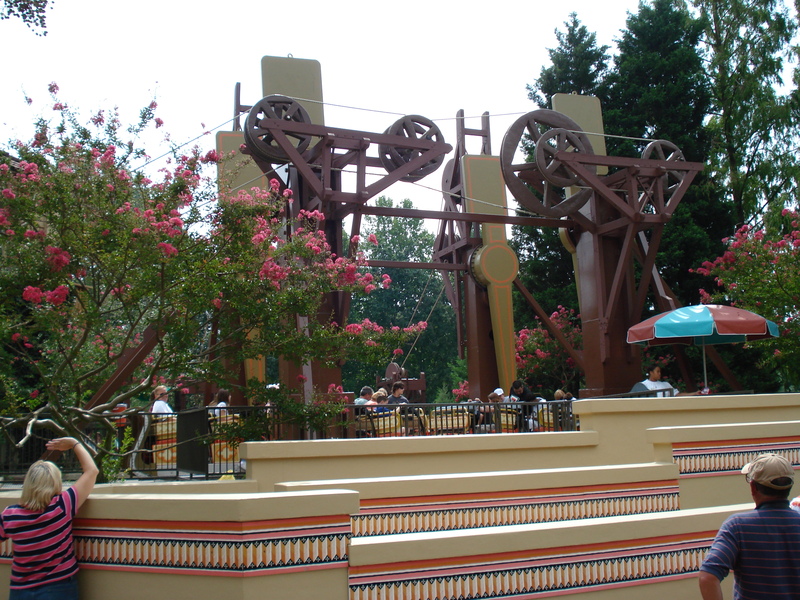 Unfortunately I don’t have many photos of the buildings or scenery of the park as most of them are of the rides. I will post what photos I do have though. This is the only one I have of the Banbury Cross area. Next is the Aeronaut, a one of a kind Skyride that opened here in 1975. This is the only one like it ever built as there are three stations arranged in a triangular layout. The ride is a one way ride so if you board in Banbury Cross, you must disembark and get back on the ride at the Aquitaine station, do the same at the Rhinefeld station to get back to Banbury Cross. Here is an on ride video of the entire ride including looks at the drive station in Banbury Cross, the station in Aquitaine, and the tension station in Rhinefeld. Next is Heatherdowns (Scotland) and the first ride we come to is the Tweedside Train Station. The Busch Gardens Railway will take you on a two and a half mile loop in scaled down versions of the trains that use to run in Europe. After departing the Tweedside Station, you’ll make stops in Festa Italia and Caribou in New France before returning to Tweedside. The round-trip journey will take about twenty minutes though this on-ride video is about 15 minutes long. It took me almost an hour and a half riding both sides of the train to get the best possible footage. 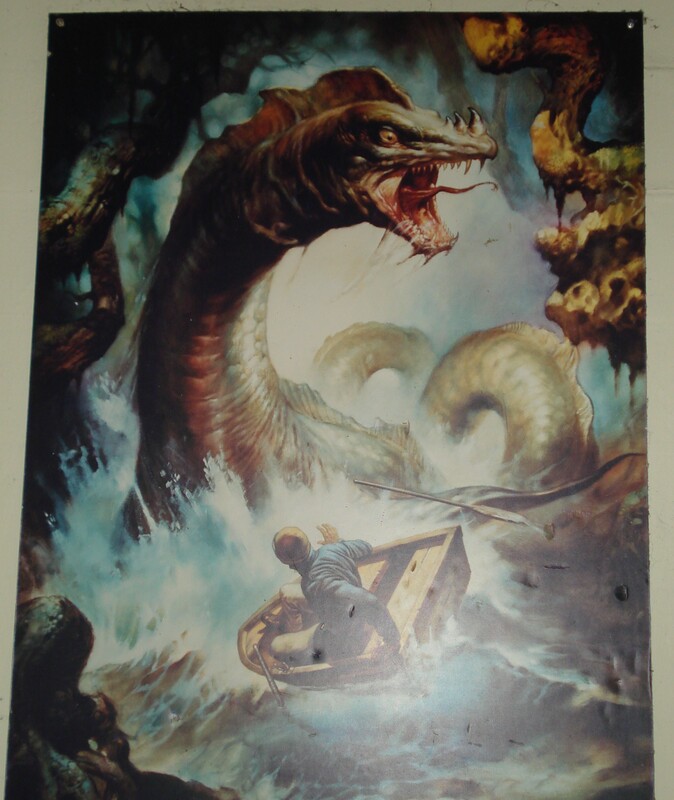 Next up is Loch Ness Monster. 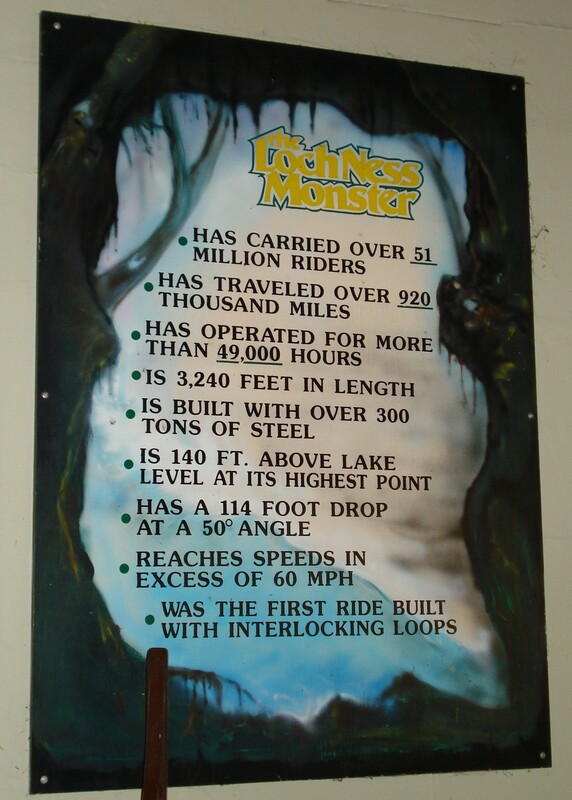 The Loch Ness Monster, or “Nessie” as some enthusiasts call her, was built by Arrow Dynamics and designed by the famous Ron Toomer. Both are pioneers in the roller coaster industry. This coaster opened on May 20, 1978 as the worlds tallest at 140 feet tall and the worlds first coaster to have interlocking loops. 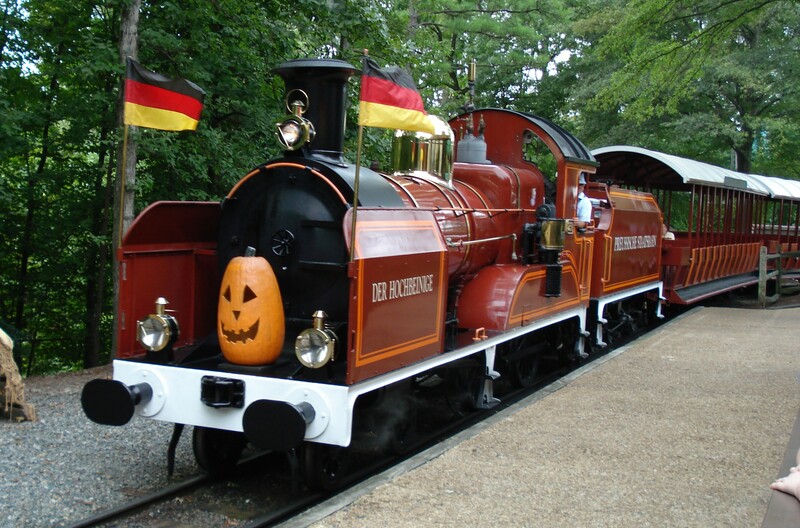 The only other one to have this feature was the Orient Express at Worlds of Fun near Kansas City, Missouri, USA. 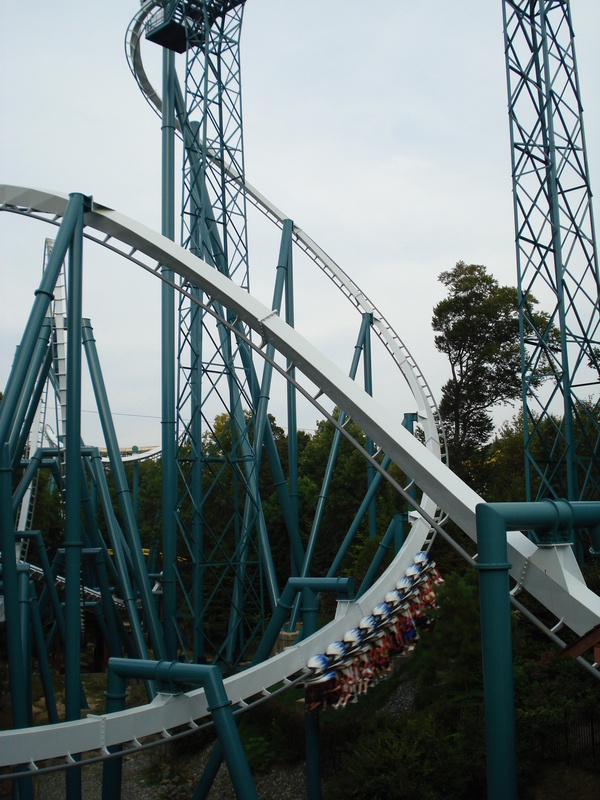 That coaster was later removed in favor of a new inverted roller coaster called the Patriot. 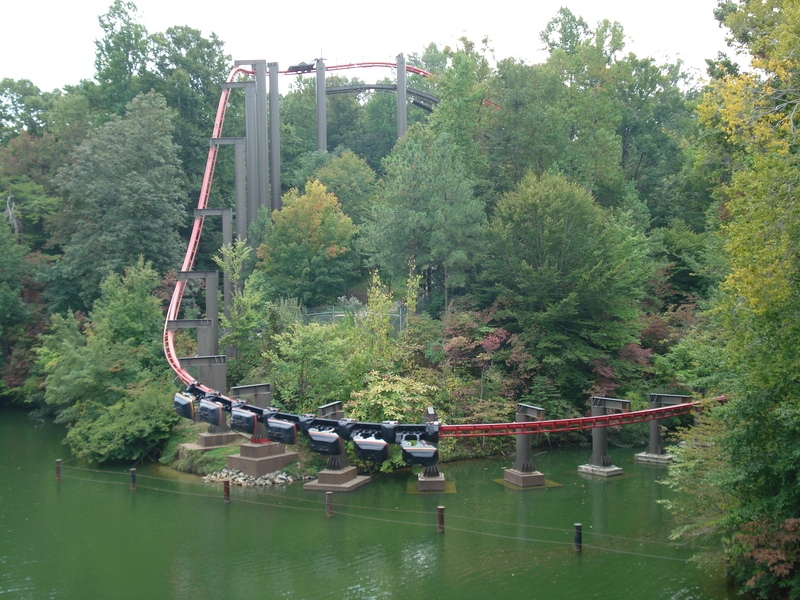 The ride starts by ascending a lift hill slowly, then making a right turn and then dropping 114 feet into the ravine below. 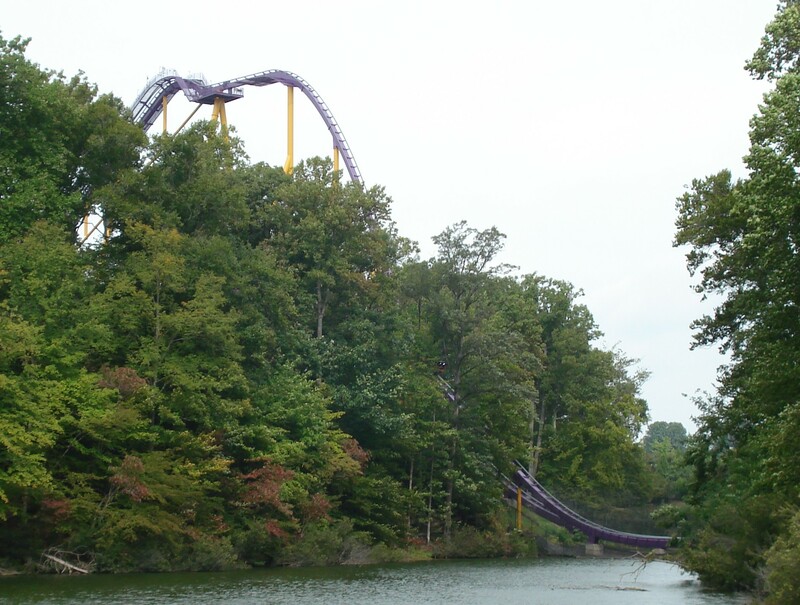 After that 114 foot drop, riders then climb into a U-turn over the former Land of Dragons kids play area and then down into the first interlocking loop. 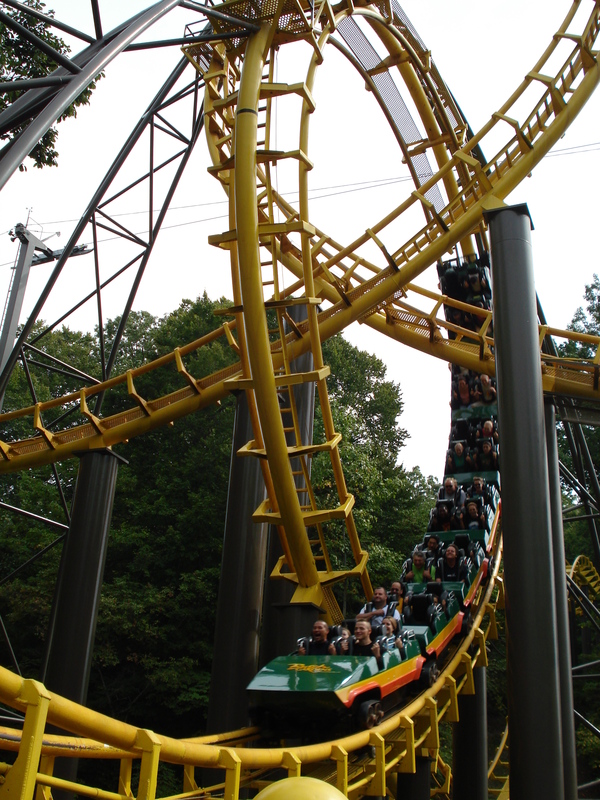 After that, the train runs through a of mid-course brake run and then into “Nessies’ Lair” which is three downward spiraling helices in a tunnel. 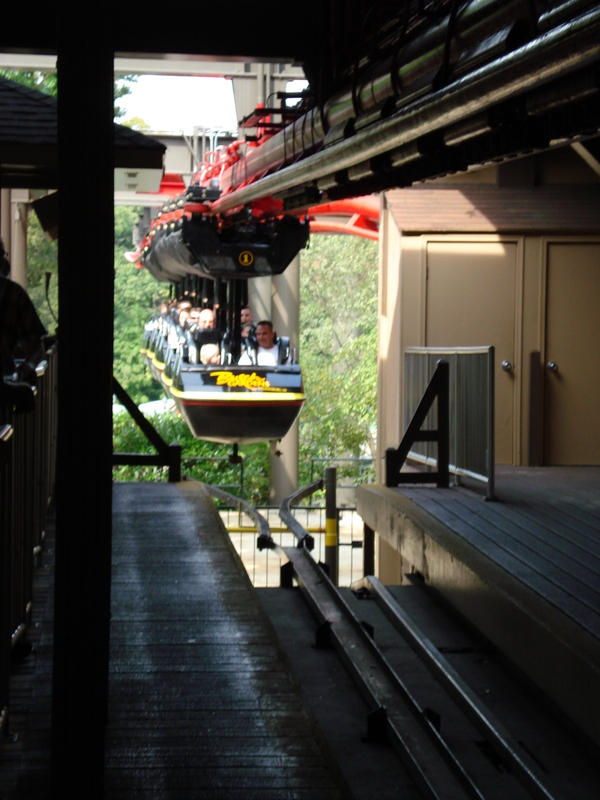 After your trip through the tunnel, riders emerge at the bottom and immediately engage in a second, smaller, lift hill. 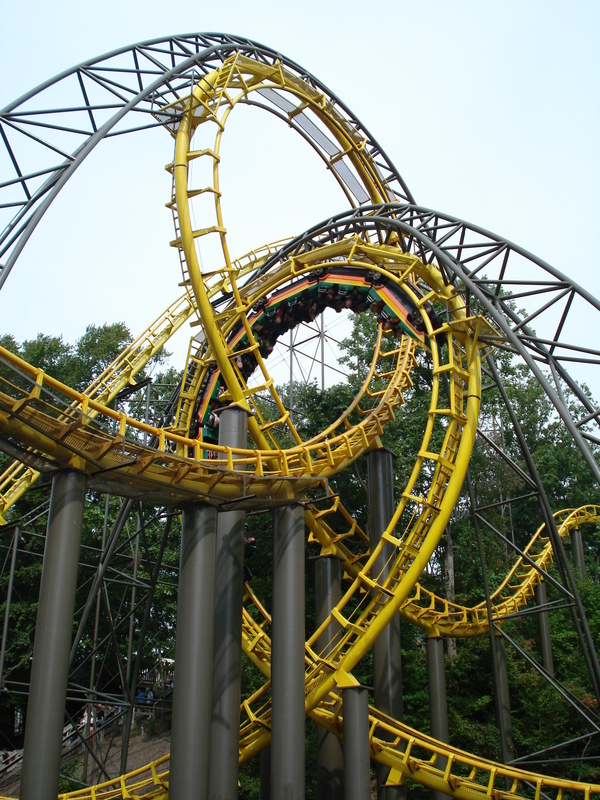 Once at the top, riders make another U-turn and then makes the final drop into the bottom half of the interlocking loops. 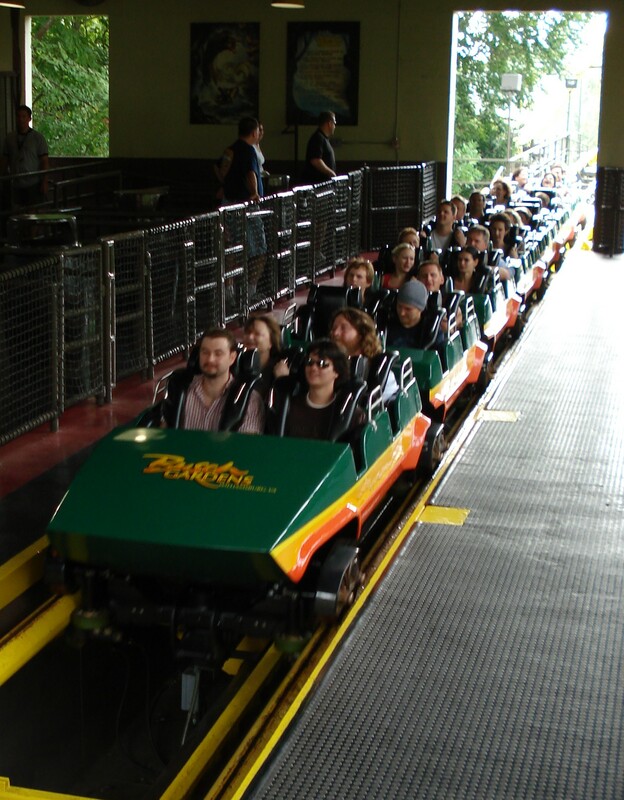 This type of coaster is a “terrain” coaster, meaning that it was specifically built to follow the terrain of the area it is in thus also making it a Custom Looping model from this company. The coaster is actually very smooth given that most coasters from Arrow Dynamics are a bit rough.I would say this coaster is completely re-ride able as I did at-least ten time during my three-day visits in 2006 and 2010. 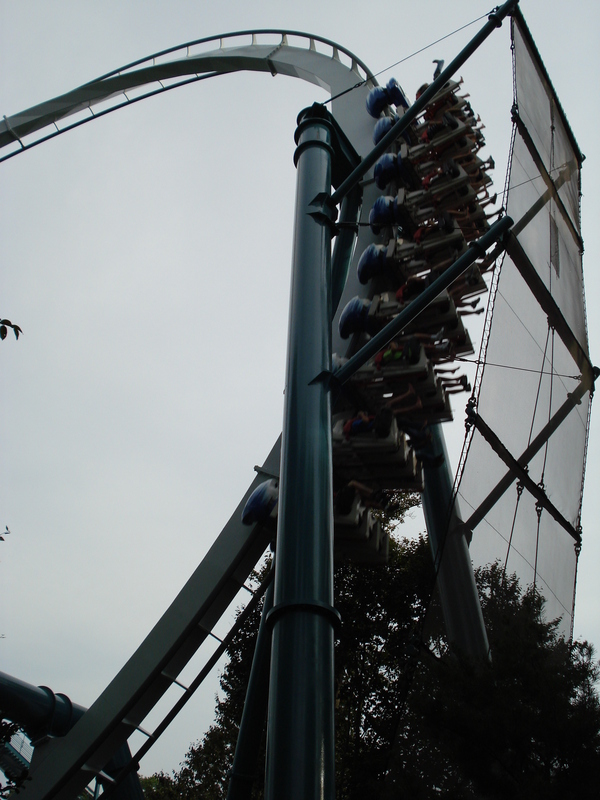 Here are the stats: The coaster is 3,240 feet long, 140 feet high, has a drop of approximately 114 feet, two inversions, a top speed of about 60 mph, and a total ride time of about two minutes and ten seconds long. 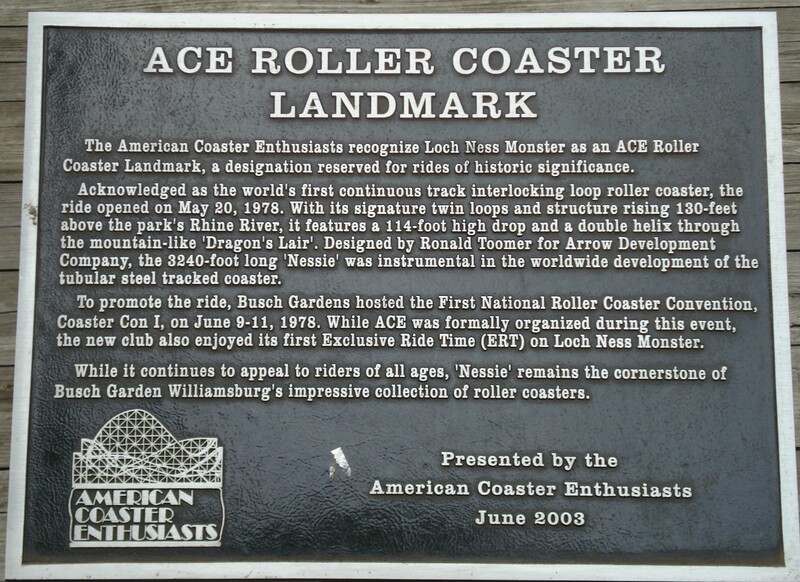 This coaster was given the ACE Coaster Landmark award on June 17, 2003 for being the first roller coaster to feature interlocking loops. 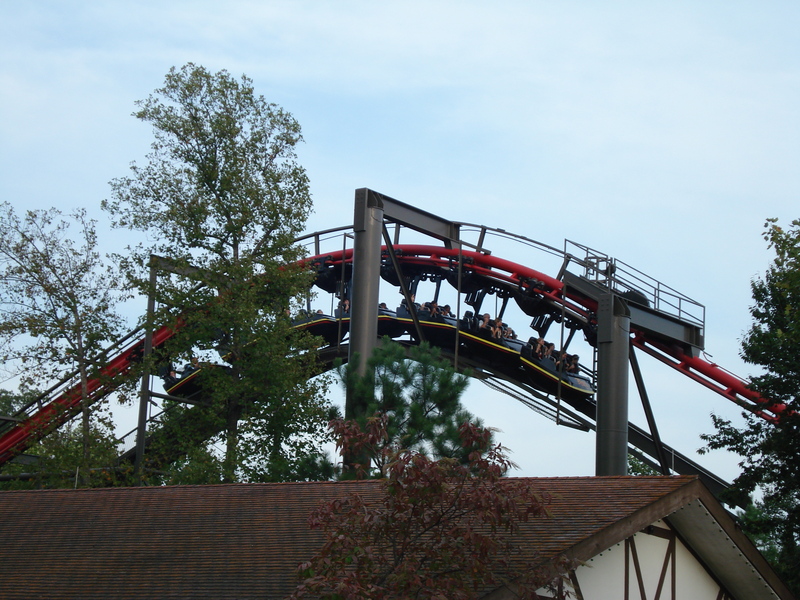 Busch Gardens also hosted the first ACE (American Coaster Enthusiasts) Coaster Con(vention) from June 9-11, 1978 in order to help promote the coaster. This is also the date that ACE was formally organized, members that attended this event were treated to several hours of ERT (Exclusive Ride Time) that was set aside for members of ACE. ACE has become a world-wide nonprofit organization devoted completely to the enjoyment of roller coaster across the world. You can go to ACEonline.org or search on the internet for a roller coaster club that’s closer to your area of the world. I myself am a member of the FLCC (Florida Coaster Club) and you can find them at Floridacoasterclub.com. 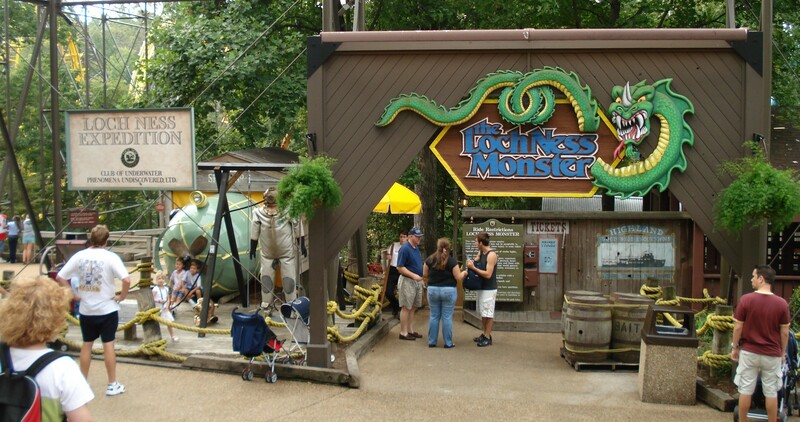 Here is an off ride video I have of the Loch Ness Monster. 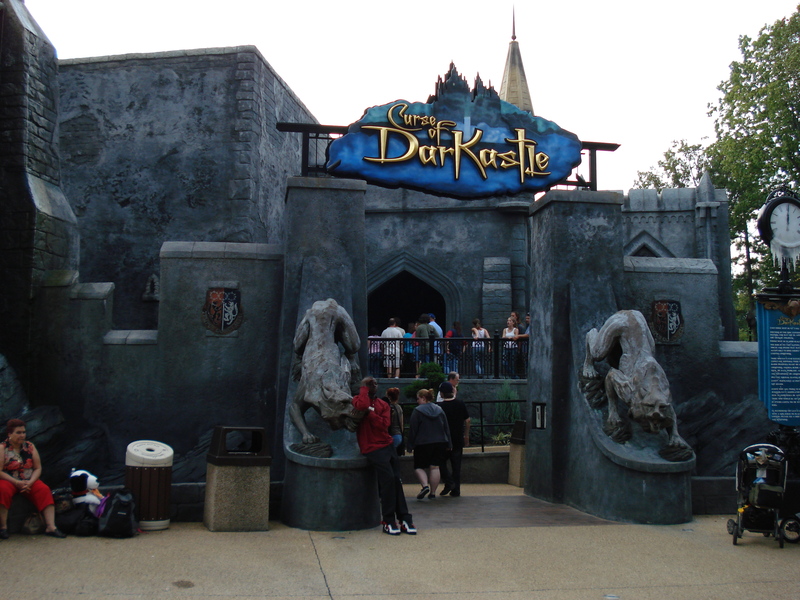 This area was once known as Hastings , part of the England area, but it was re-themed in 2001 to Ireland which was the first new land at the park in over twenty years. 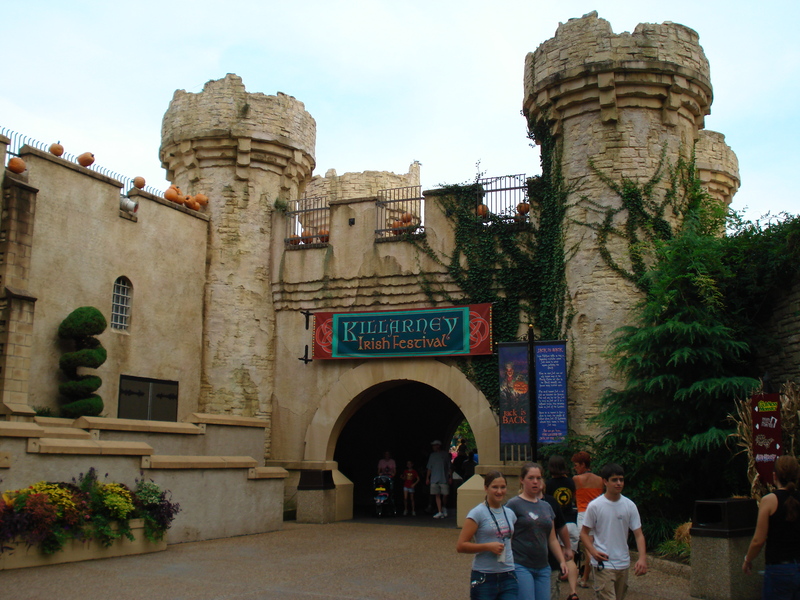 This area does have a motion simulator ride called Europe in the Air that takes riders to all the major cities in Europe through the air. 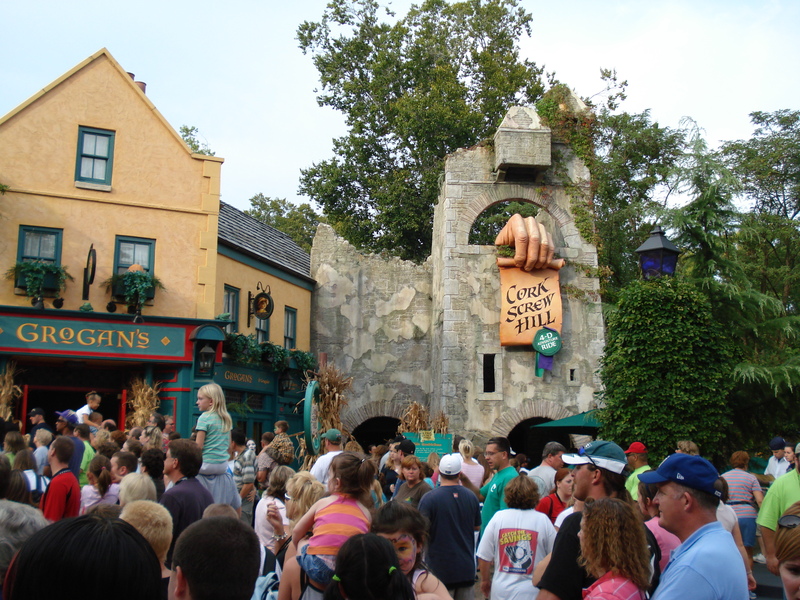 This attraction used to be where the Corkscrew Hill simulator was which was a fun Irish themed ride. There are a number of different shops and a restaurant that serves Irish cuisine. 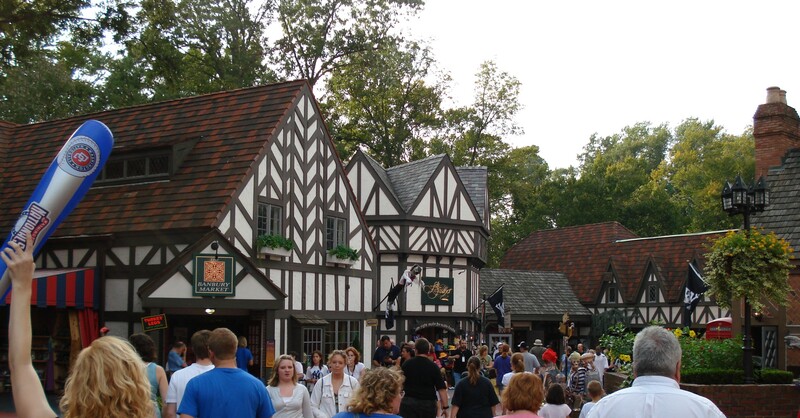 There also is an indoor theater called the Abbey Stone Theater which house a different show every few years. 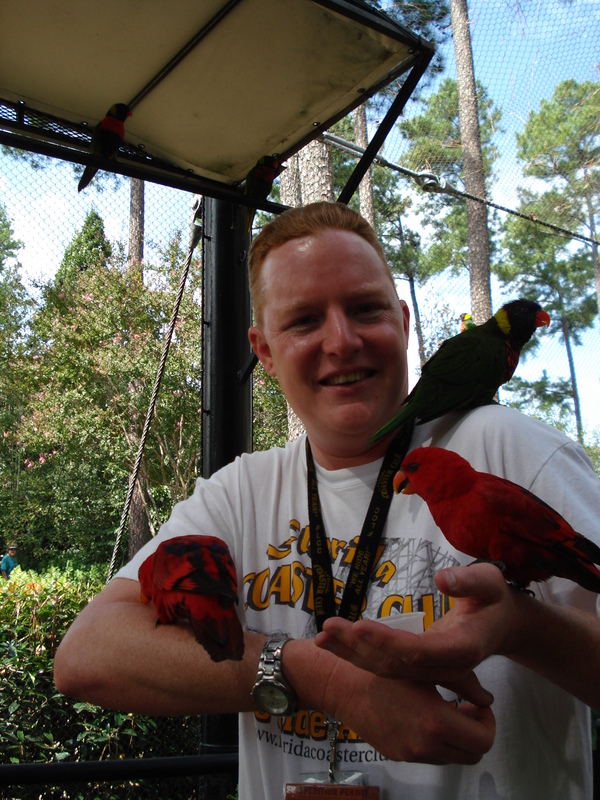 Just outside the village on the way to Aquitaine is the Pet Shenanigans Theater, an outdoor stage show where the animals are the stars. 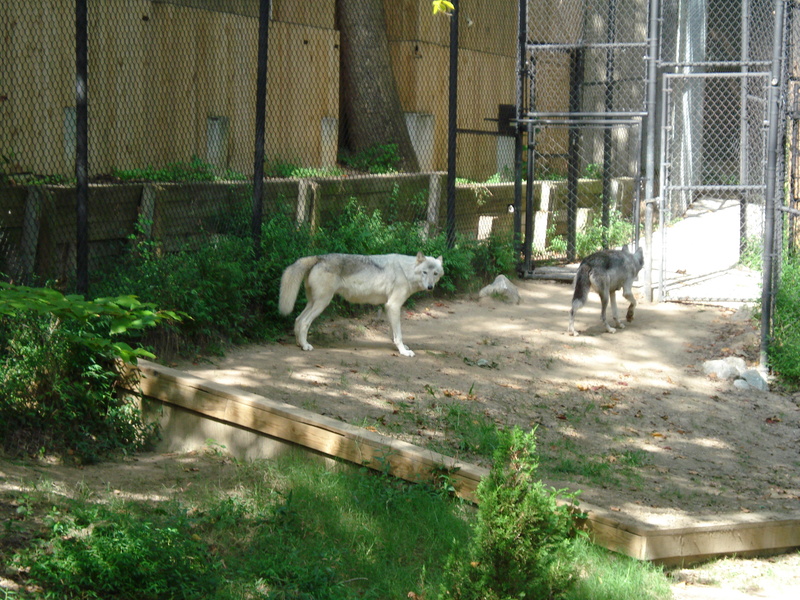 Thy includes house cats, dogs, pigs, birds, and other animals. There is an area here called Eagle & Wolfe Valley. 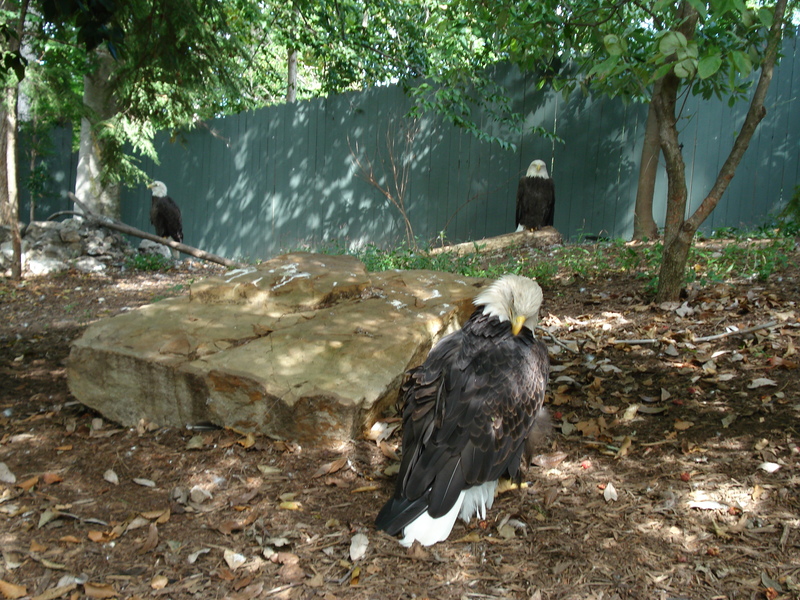 You’ll see a number of rescued American Bald Eagles and a small pack of European Wolves, at-least I believe they’re European Wolves. I also believe this is where you can feed the Lorikeets as well but I do have to warn you that they are prolific poopers so bring an extra shirt to wear that you don’t mind getting a little “dirty”. Now that we’ve changed our shirts and washed off, we’ll walk to our next area. This area has a few boutiques, one station of the Aeronaut Skyride that arrives from the Banbury Cross area and departs for the Rhinefeld section, and the Royal Palace Theatre. The Royal Palace Theatre is a large covered outdoor theater that hosts many shows thought the year. 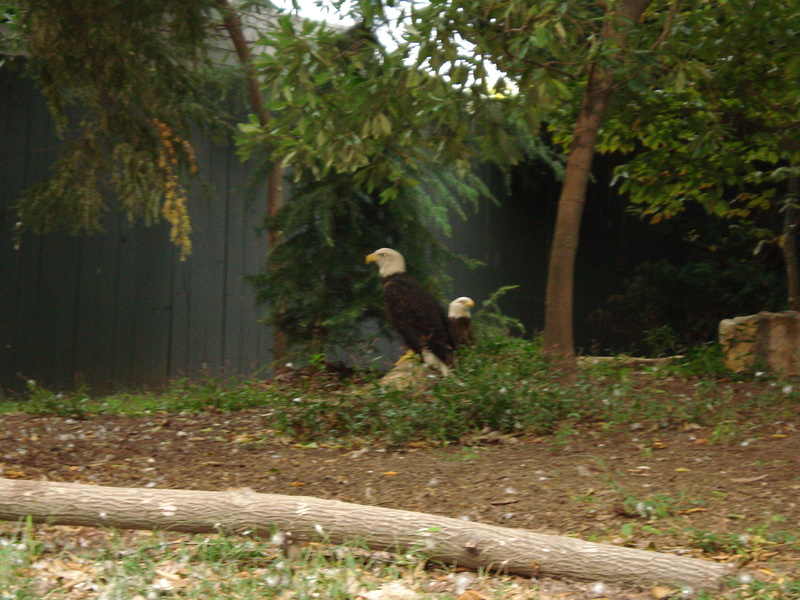 The star attraction in this area is the Griffon roller coaster. The Griffon was named after a legendary creature called the Griffin, which has the body, tail, and legs of a lion and the head and wings of an eagle and eagles talons on the front paws. Griffins are though to be the king of all creatures and are known for guarding priceless possessions and treasure according to ancient mythology. 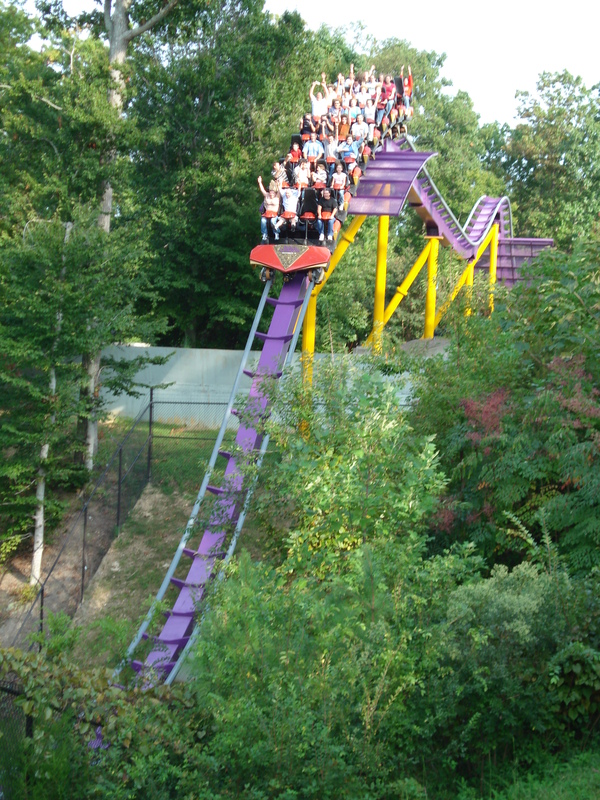 This coaster was built and designed by B&M ( Bolliger & Mabillard) and opened here in 2009. 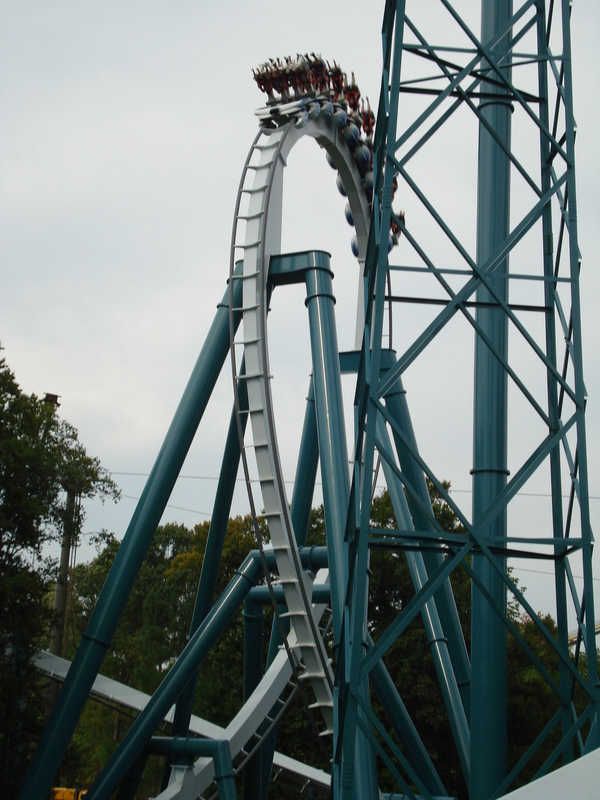 It is one of the few Dive coaster models they have built and the second that was built in the USA behind SheiKra at its sister park, Busch Gardens Tampa. 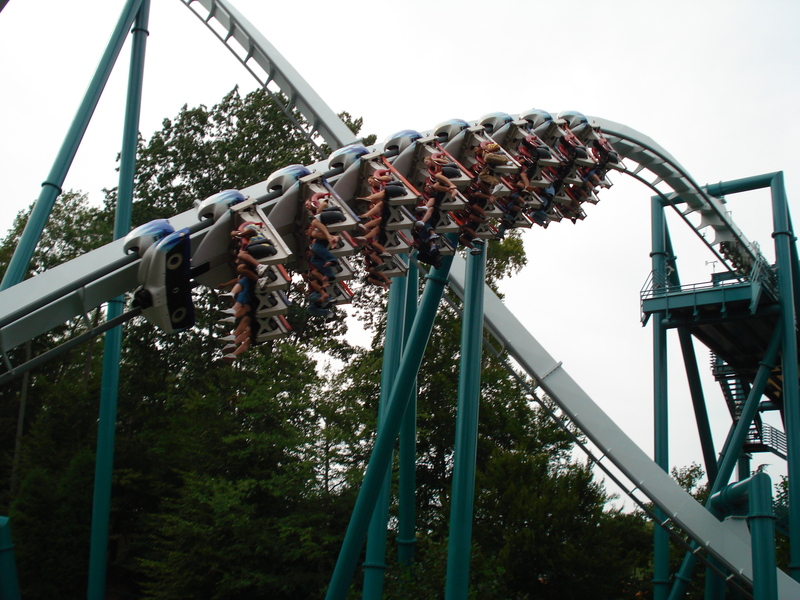 A Dive coaster is one that has two or three rows that seat between eight and ten people across and has a holding brake at the top of the first drop so that riders are left dangling over the edge between one to five seconds before being released. 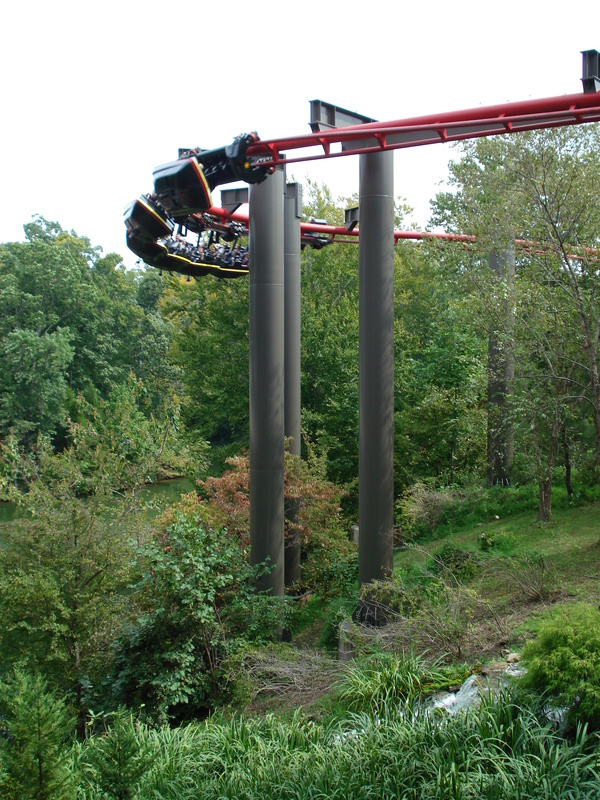 Griffon stands at 205 feet tall with the first and second drop angle at ninety degrees, has two inversions, a splashdown water effect that doesn’t get riders wet, a total track length of 3,108 feet, a top speed of 71 mph, and a ride time of about three minutes. 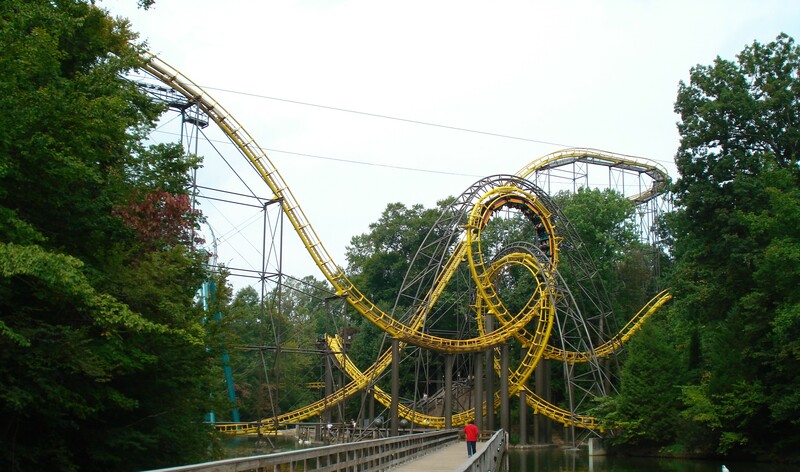 This was the worlds first dive coaster to feature trains that are completely FLOORLESS. This is definitely a must ride and I recommend the front row for first time riders as the view from up top is simply spectacular. 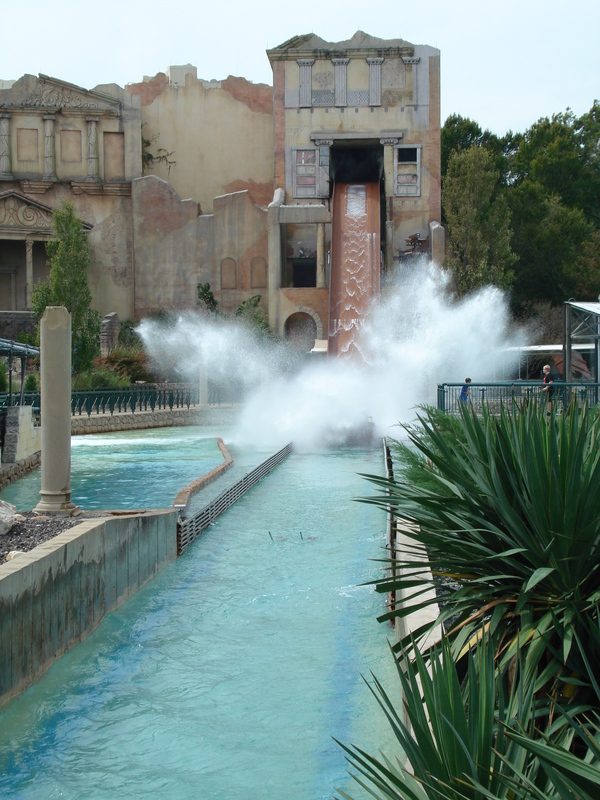 The splashdown effect does not get riders wet at all, in fact, it soaks unsuspecting pedestrians that are walking by the pool. Now for the next area. 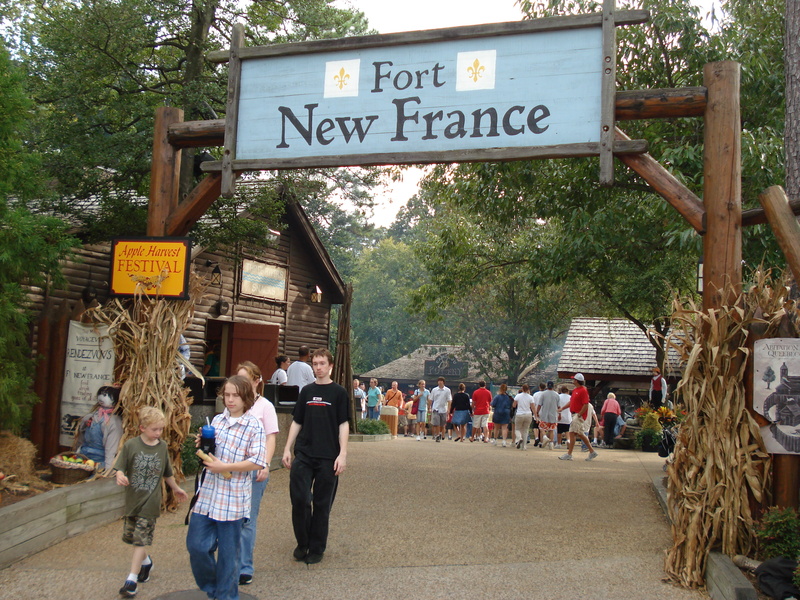 This area is based on the colonial area of French Canada which mainly consists of shops that are themed to and sell items related to the theme of the area. There’s also an outdoor restaurant called Trappers Smokehouse which serves smoked items like beef, ribs, and chicken. 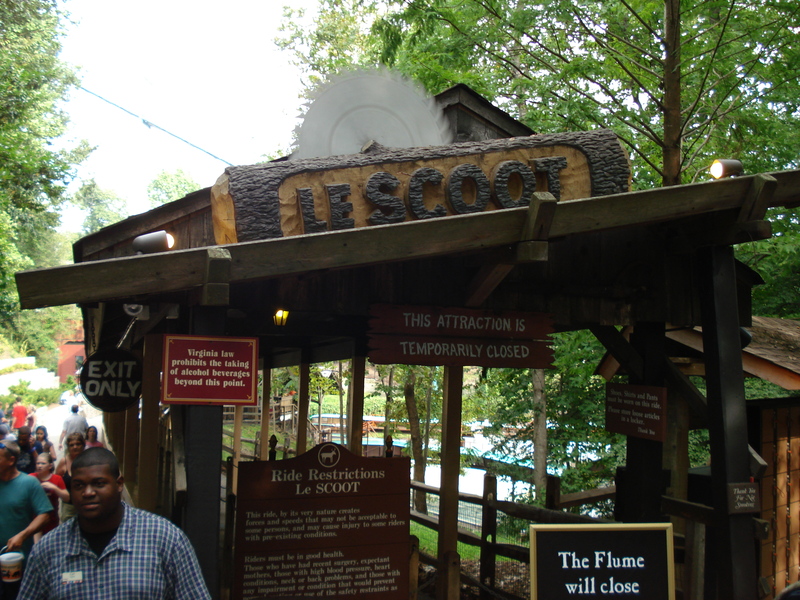 There are two rides here, one of which is a Scrambler carnival attraction called Le Catapult from the Eli Bridge Co and the other is a log flume ride called Le Scoot that opened here in 1975. 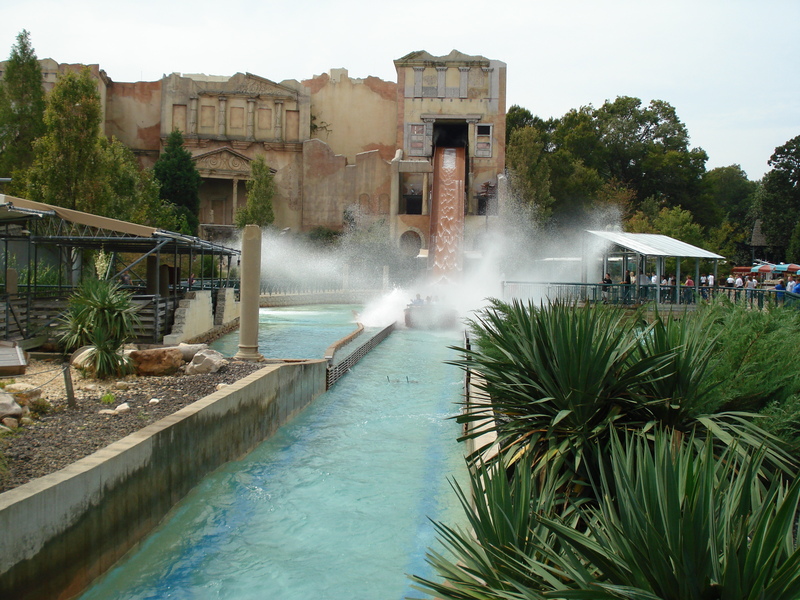 The ride is pretty basic with very little theming but it was an enjoyable ride through the trees before the big drop at the end and you do get wet on this one but not completely soaked. Onward to out next area. 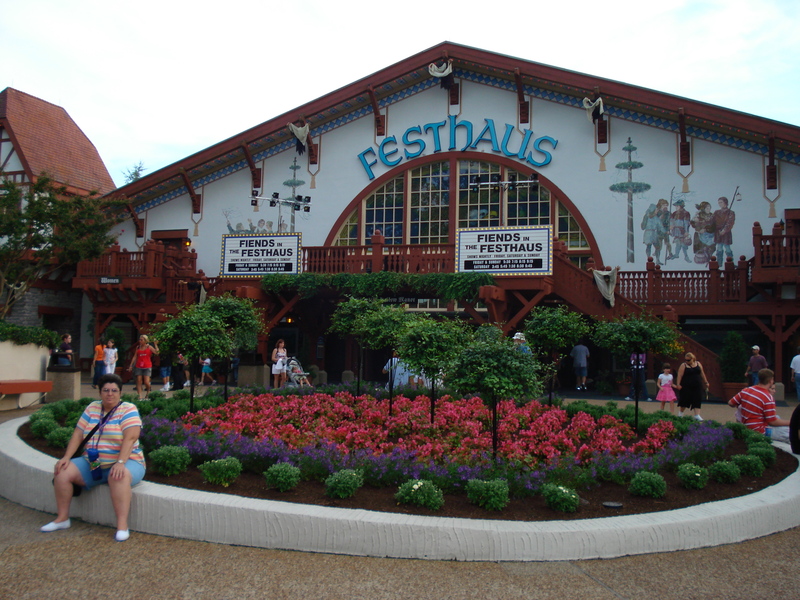 This area is home to many different rides, shops, and restaurants including the Festhaus where, at certain times of the day, people can eat and watch a show called Entwined. That show features the most famous fairy tales from the Grimm Bros. I haven’t seen the new show yet as the old set featuring a German Band playing traditional Oktoberfest songs while actors did traditional dances under the band and everyone was wearing lederhosen. 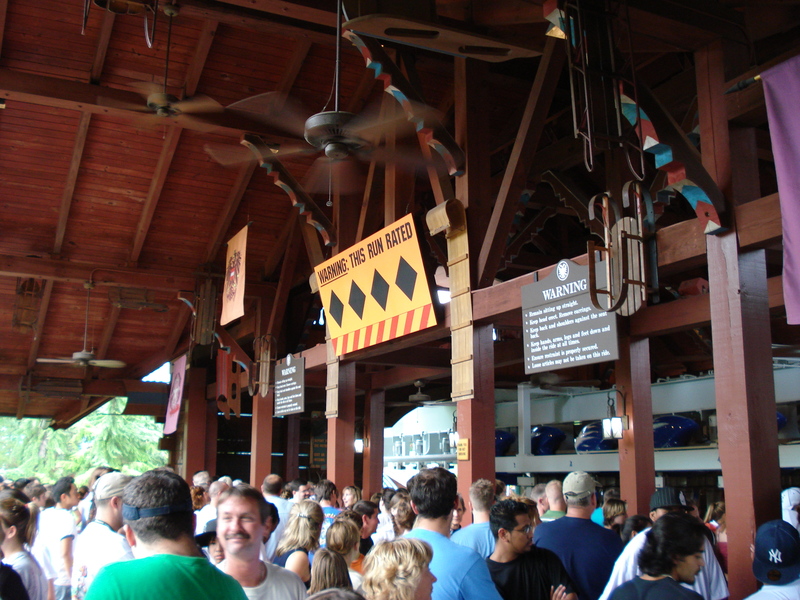 This area used to have a really good suspended coaster from Arrow Dynamics called Big Bad Wolf that was removed in 2009. 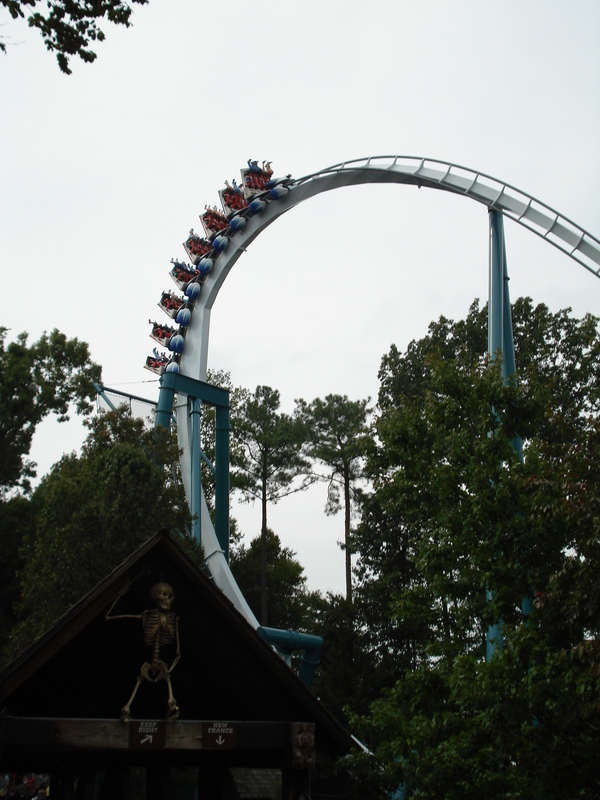 The tag line for the ride was “Ride at the speed of fright”. The ride begins when the train exits the station and makes a left and then a right turn and gets pulled up a small lift hill behind the Der Autobahn and Der Autobahn Jr. bumper cars ride. 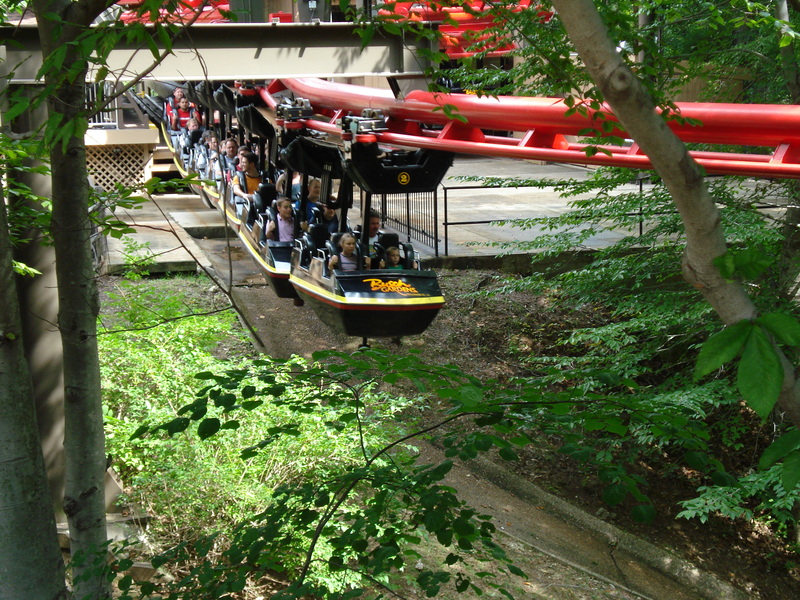 Then the coaster travels through a German village and then goes off into the woods through a series of upward and downward flat spins where it ascends another, much larger, lift hill about 100 feet high. 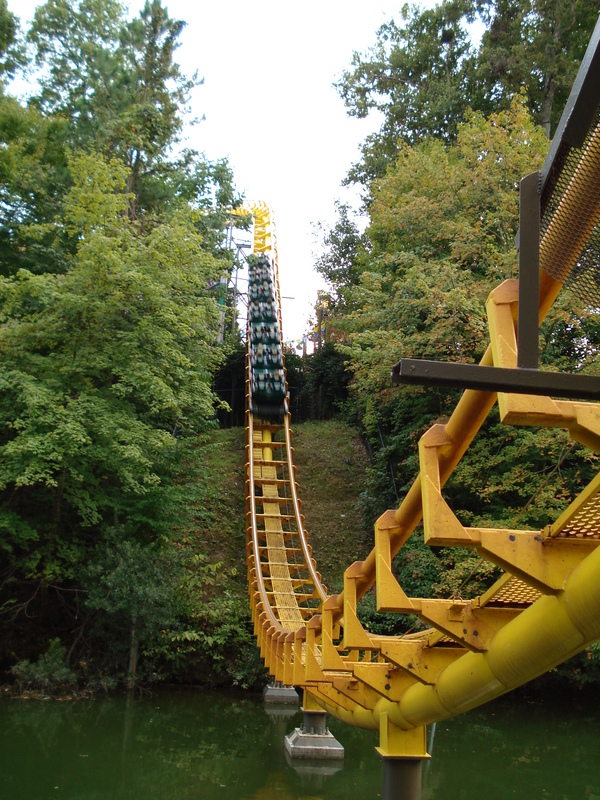 Once the train reaches the top, the coaster then makes a left turn and drops towards the Rhine River turning towards the banks of the river at the last second. The coaster then comes back up making a 180 degree turn while ascending, then another 180 degree turn back into the station. Here’s my on ride video I shot on my first visit in 2006 and I do apologize for the poor quality of the video. This coaster was one of the best suspended coasters I’ve ever been on and it’s best ridden at night as most of the track is hidden from the non riders. This coaster was designed by the famous Ron Toomer at Arrow Dynamics and they were both pioneers in the amusement park industry. 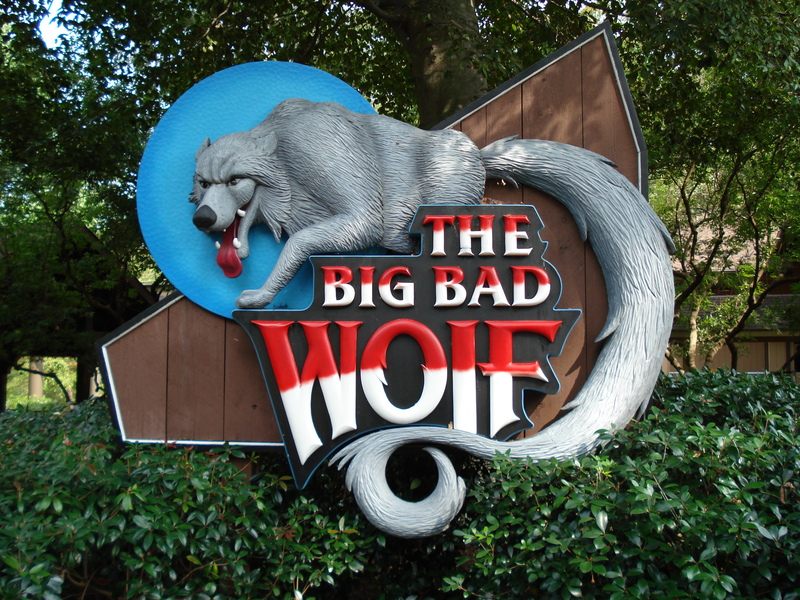 Big Bad Wolf opened on June 15, 1984 to rave reviews from the general public and the coaster enthusiasts. It was 2,800 feet long, 100 feet high, had a top speed of about 48 mph, and a ride time of about three minutes. 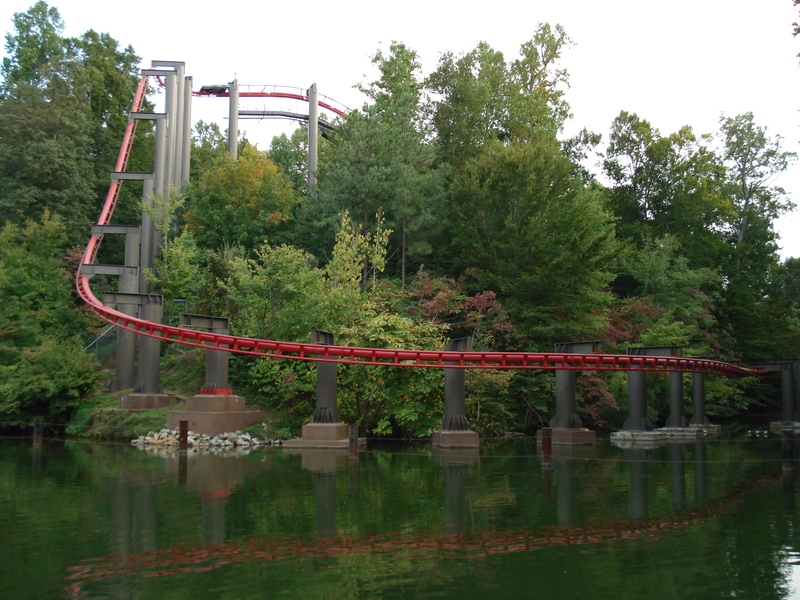 Here is an official on ride view from Theme Park Review of Verbloten, the coaster that eventually replaced it. 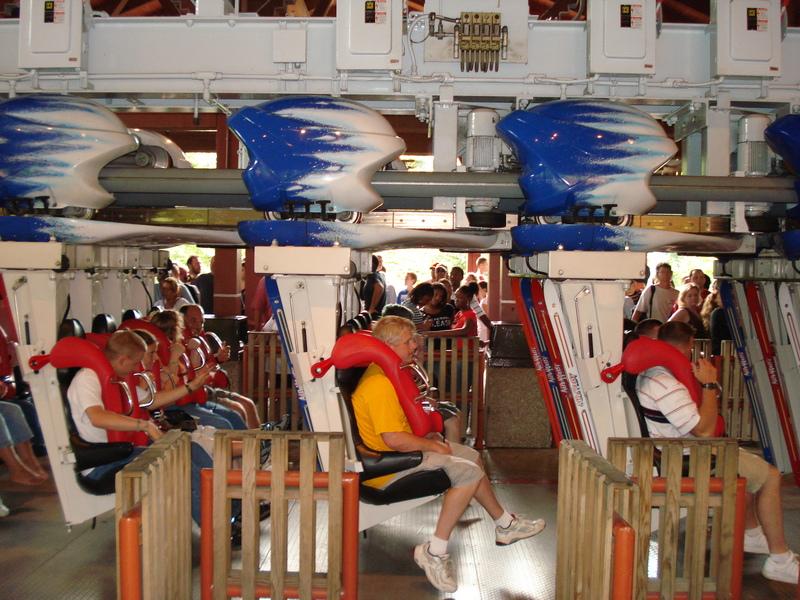 This coaster was manufactured by Zierer and features two launches and three different show settings in the building the coaster travels through. 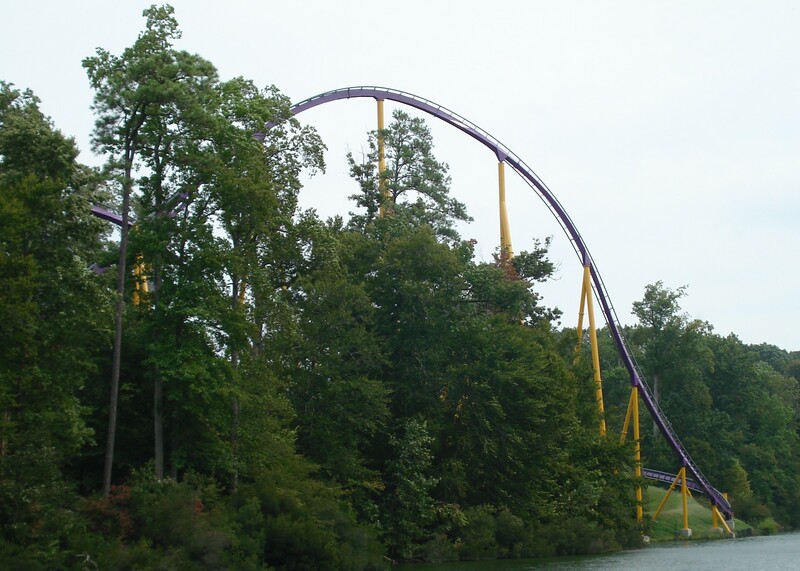 This coaster opened here on May 18, 2012 and is 88 feet tall, has 2,835 feet of track length, a top speed of about 53 mph, and a ride time of about three minutes and twenty-five seconds. 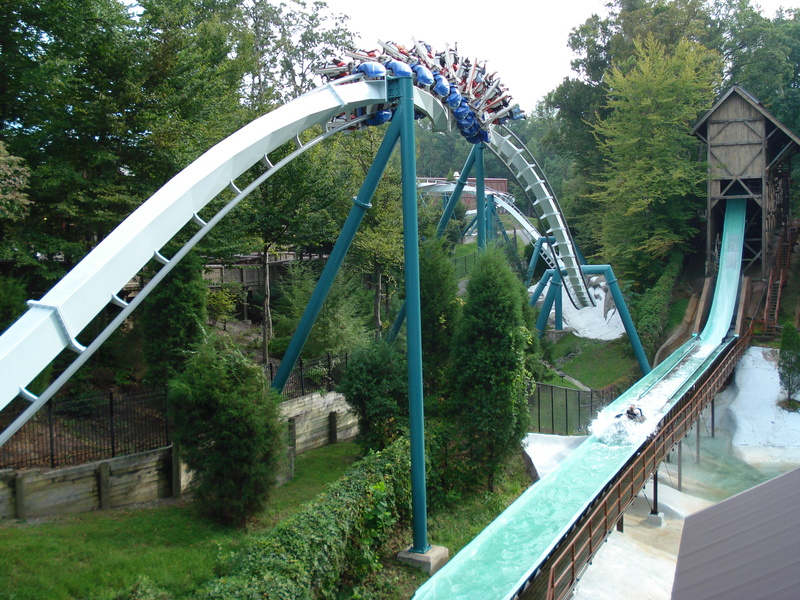 There was also another roller coaster in this area called Drachenfire but this coaster only operated for a few years from April 4, 1992 to July 0f 1998. The park put the coaster up for sale and nobody bought it so it was removed so the steel could be recycled in 2002. It was removed as riders thought it was a very rough coaster. It was built and designed by the same person and company that built Loch Ness Monster and Big Bad Wolf. It was 150 feet tall, had a top speed of about 60 mph and a total track length of 3,550 feet long. Here’s an official on ride video from Theme Park Review. Here’s my video of what remained of both coasters on during my last visit in 2009. Next up is our next ride. This is a indoor motion simulator dark ride that utilizes air, 3D screens, and water in most of the rooms the vehicles travel through. 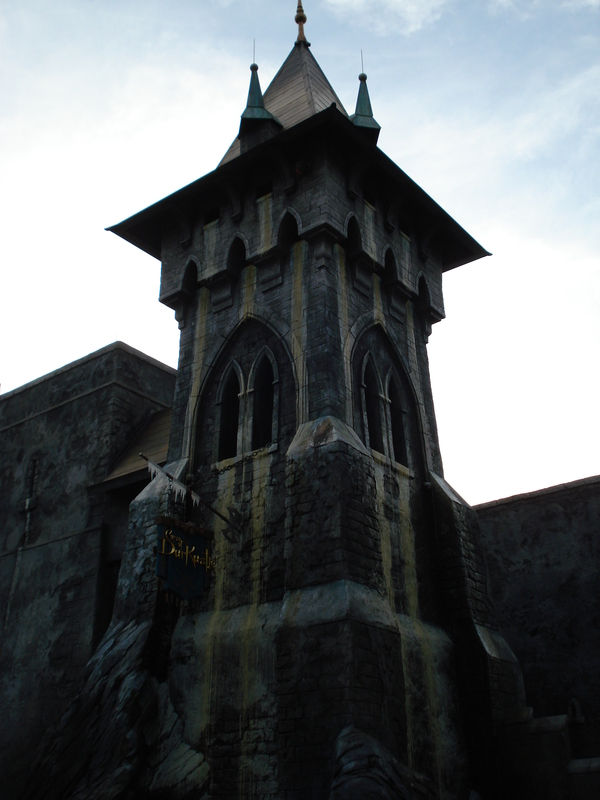 It is set to a ancient German King that terrorizes guests as they “tour” the castle. This utilizes the same ride technology that Universal Studios uses in their ride called “The Amazing Adventures of Spiderman” at it’s Islands of Adventure park in Orlando, Florida, USA. This drop tower was added after my last visit so I can’t tell you what it is like but it looks really thrilling as it is the tallest ride at the park. It opened on August 19, 2011 and is 249 feet tall. The gondola rotates as it rises to the top and I do believe there is music being played as it ascends the tower. 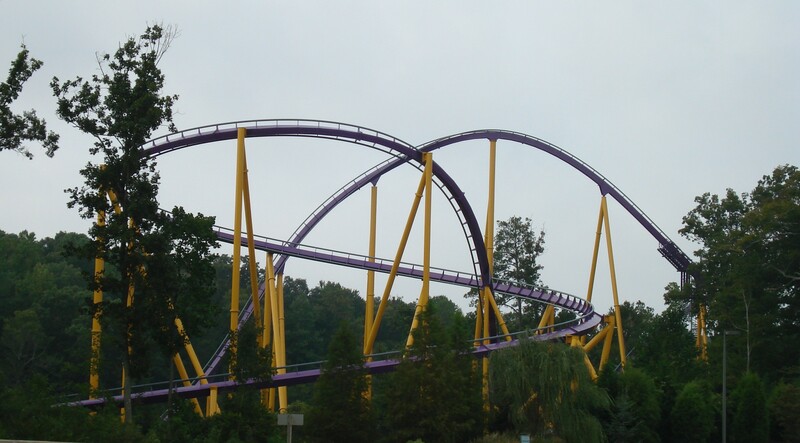 Here is an on ride view from deathbyillusion on YouTube. 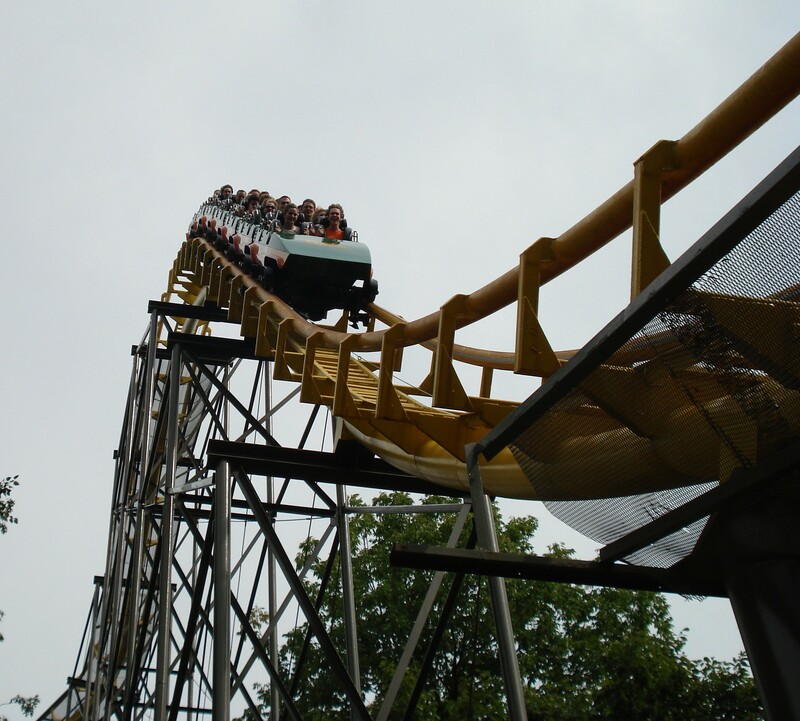 There are a number of other rides for those not brave enough to ride the coasters including Der Wirbelwind, a rotating swings ride commonly called a Waveswinger, and Wirbelwindchen, a kids swings ride and other kiddie type rides. Now on to our next area. This was the only kiddie play place when it opened in 1994 until the opening of the Sesame Street Forest of Fun in 2009. This area may still have many of its rides, unfortunately I don’t know this as I really had no reason to venture into this area when I was there last in 2009. This area does still have its maze of jungle gyms, rope climbs, slides, and swing bridges but some of the rides have been moved and rethemed in the new area. According to Wikipedia, this area should still have the following rides. The Eggery Deggery which is a small Ferris wheel with the gondolas themed to dragon eggs, the Flutter Sputter which is a flying dragon ride, the Bug a Dug which is a ride that resembles a Music Express type ride with Lady Bug cars, Chug a Tug which is a small boat ride, and the Brook which is a wet play area. The Riffle Rapids was moved to the new area and rethemed and renamed Bert and Ernie’s Loch Adventure. 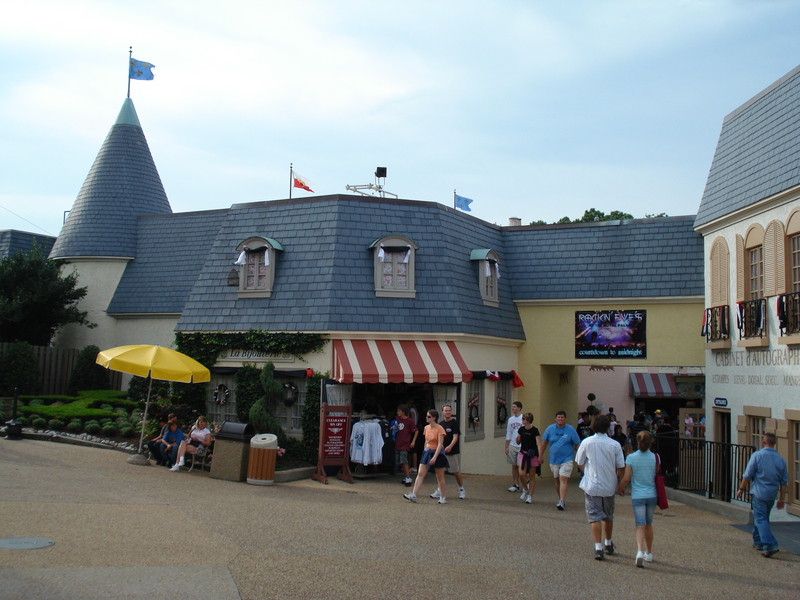 This area has a few quick service food carts, shops, a carousel, a roller coaster, and the third Aeronaunt skyride station that arrives from Aquitaine and departs to Banbury Cross. This is the parks classic 1919 wooden carousel from Allen Herschel. The carousel was operating with a traveling carnival when it was abandoned at an unknown date and time. It was found inside a auctioneer’s warehouse in pieces in 1973 when Anheuser Busch, the park owner at the time, purchased it and restored it in 14 months. It really is a rare treat to see and ride a restored, classic wooden carousel. 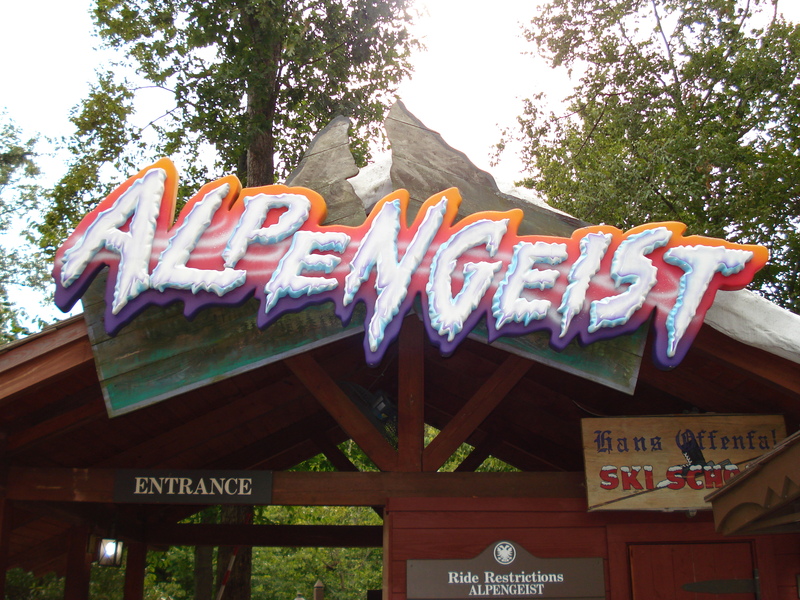 This is an Inverted roller coaster themed to an Alpine ski lift that has been taken over by a mythical beast called the Aplengeist. 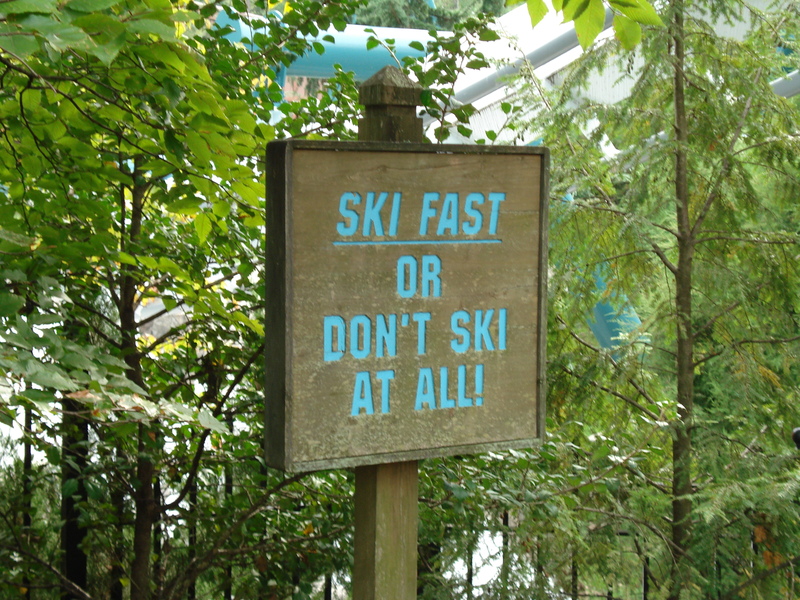 the themeing is actually pretty good, there’s even skis attached to the coaster trains. It was built by B&M and opened here as the tallest at 195 feet, and fastest at 67 mph, Inverted roller coaster in the world when it opened on March 22, 1997. This coaster also has one of the most incredible first drops on any coaster I’ve been on to date. It’s a curving 170 foot drop that turns almost 200 degrees to the right as it drops. 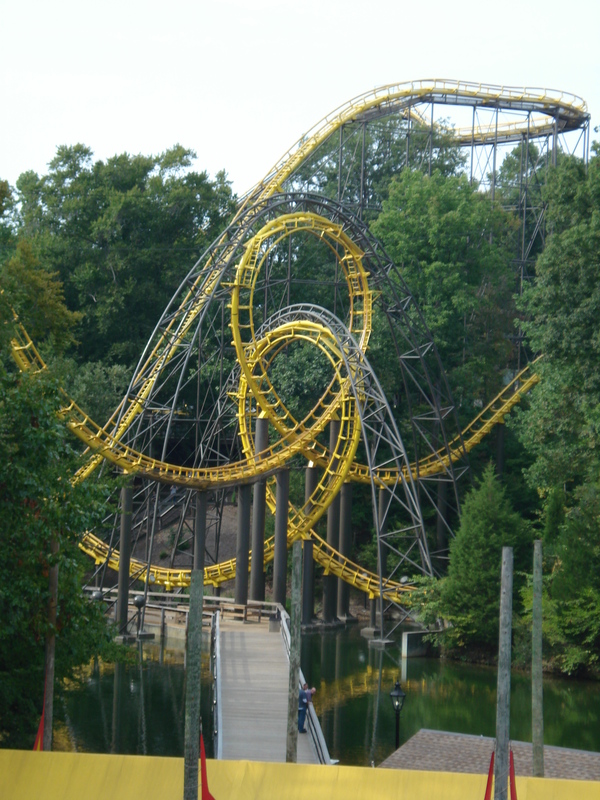 Then it goes right into an Immelmann inversion, then a full loop, and then it goes right into a double inversion element called a Cobra Roll. 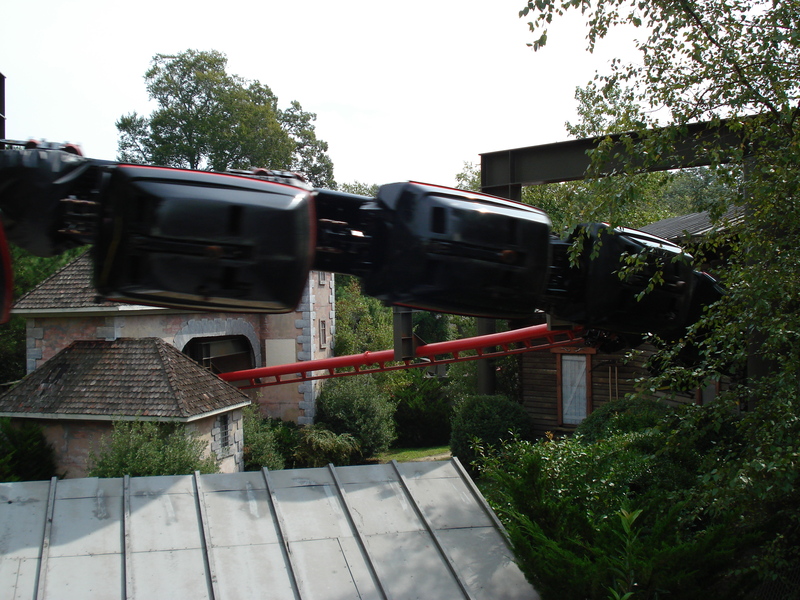 After that, the train makes a run through the block brakes, then dives under the pedestrian bridge, then through a zero g roll, then a corkscrew, an upward flat spin then into the station brakes. Here’s an off ride view from my YouTube channel. When riding on inverted roller coasters like this one, I always recommend riding front row for your first ride and this is no exception. The views are unobstructed and you can see everything in front of you but this coaster is definitely not for the faint of heart. 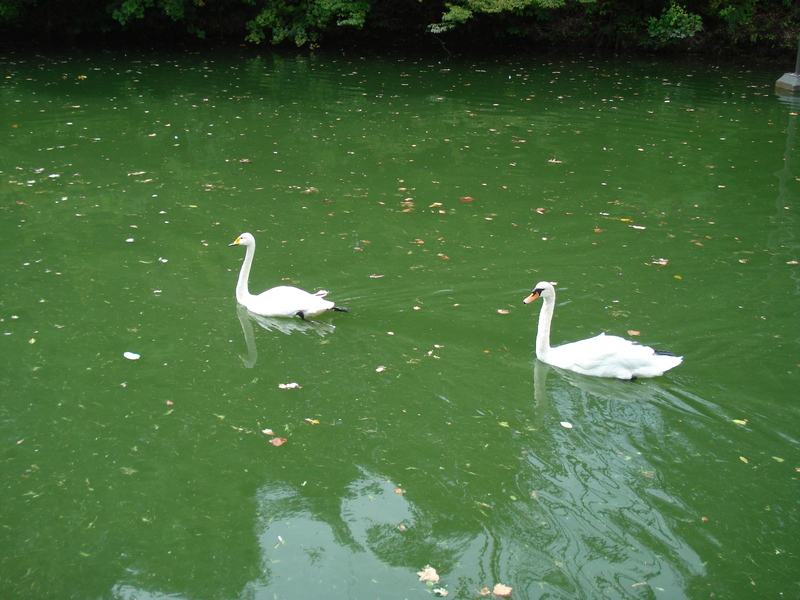 Now it is time to cross the bridge and enter our next area. 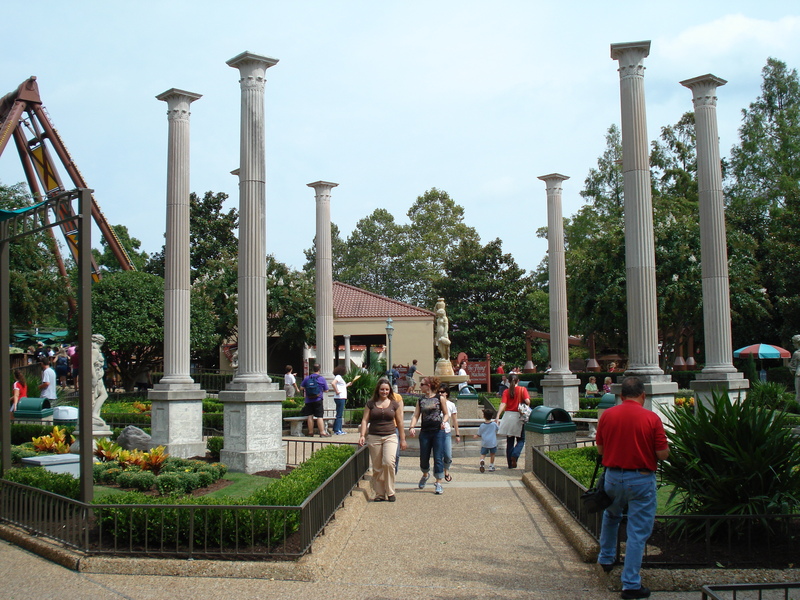 This area is set themed to the Renaissance era Italy when Leonardo Da Vinci was alive. 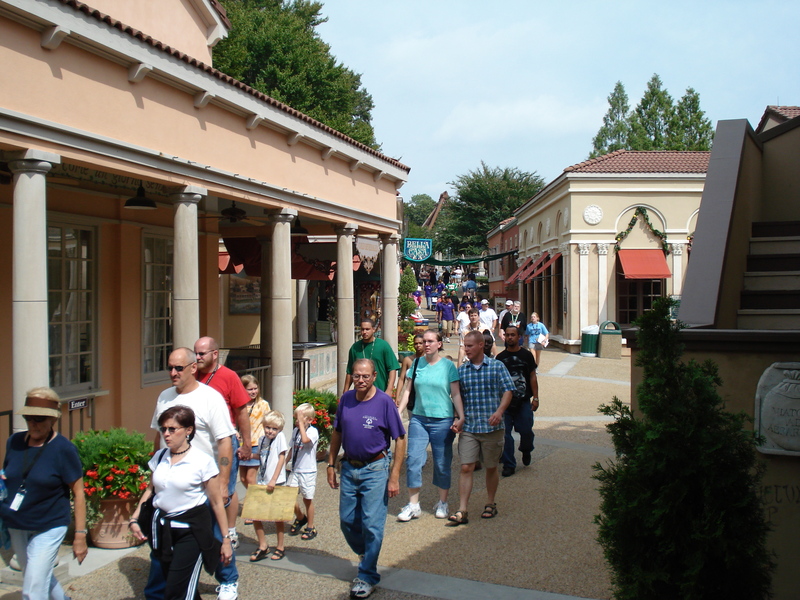 This area has rides, shops, and a restaurant called Ristorante della Piazza which has seating around a stage. 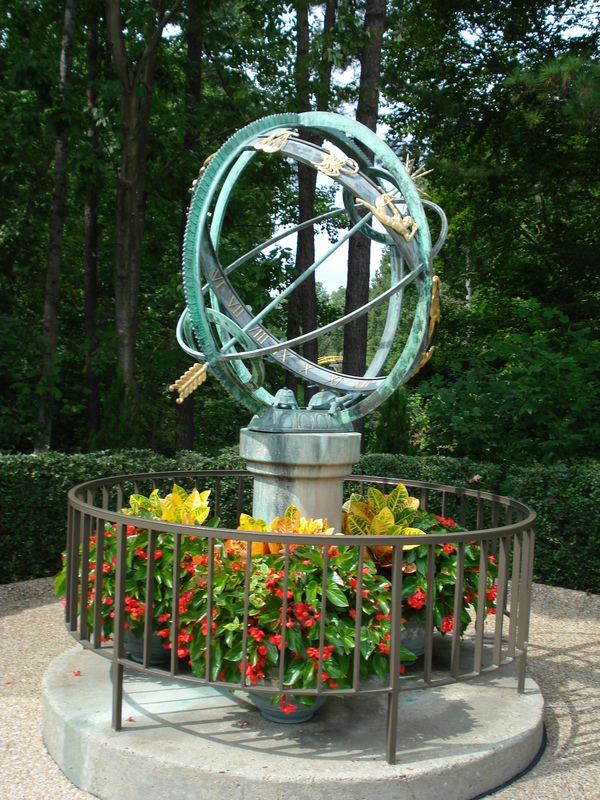 There’s also Da Vinci’s Garden of Inventions that feature statues and rides that are based on Da Vinci’s drawings. You’ll see two of the three rides that are in this area in the photos above. In the one in the middle, you’ll see part of the Battering Ram on the left. That is a swing ship ride that doesn’t go upside down. The picture on the right is of Da Vinci’s Cradle, a standard Magic Carpet type ride that swings back and forth until it rotates over the top (not going upside down). 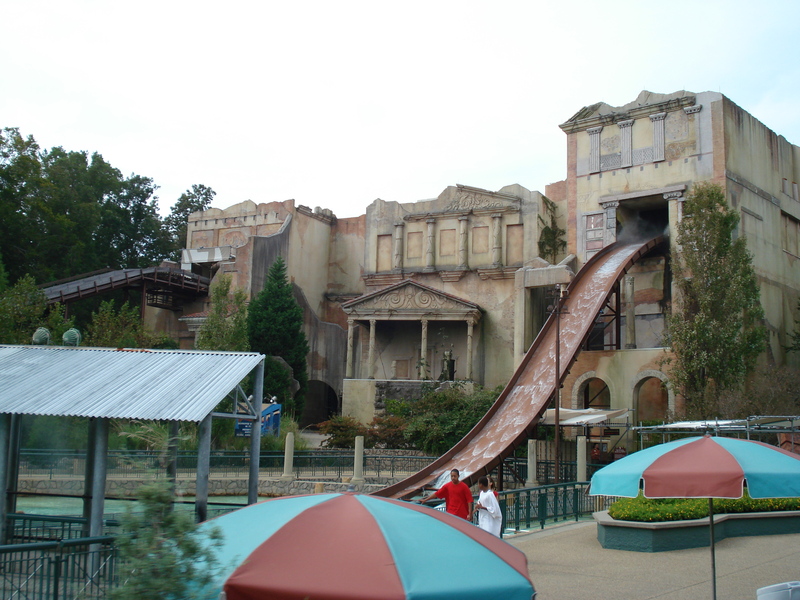 Also in this area is a Shoot-the-Chutes ride called Escape from Pompeii. 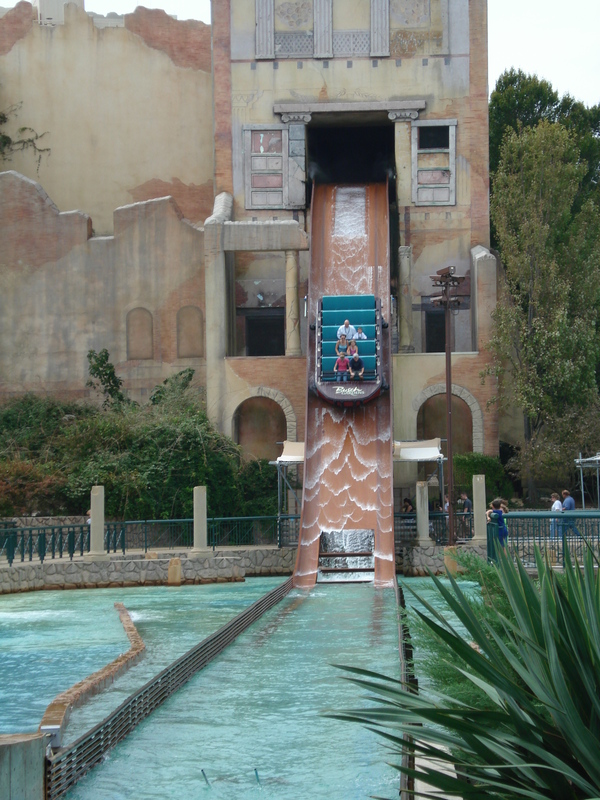 Riders board a large boat, then ride a lift hill up to the top where the boat enters the building with an ancient Roman façade. Once inside, things start to fall apart as Mt Vesuvius erupts and starts to destroy Pompeii. Fire erupts all over the place and statues and buildings start to fall and crumble and then you escape via a watery plunge into the water below soaking everyone in the boat and those nearby. 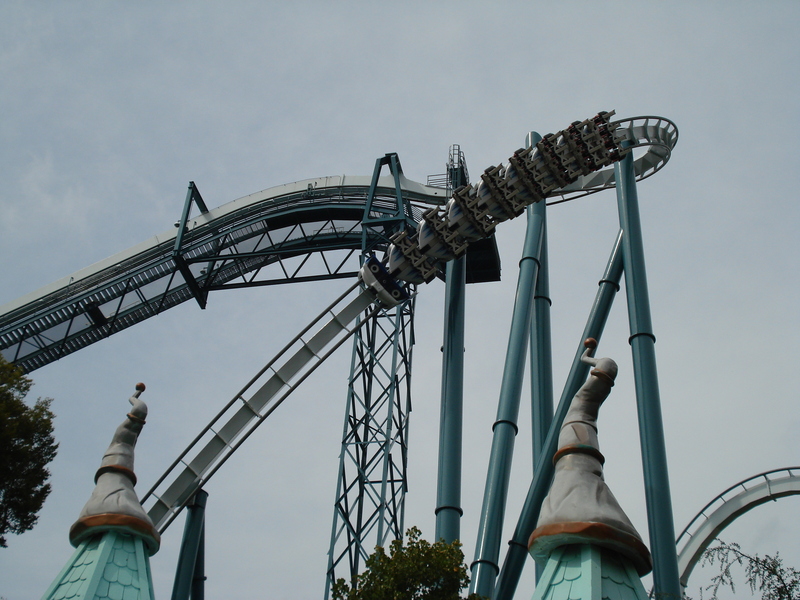 This ride was built by Intamin and opened here in 1996. It’s 80 feet high, 900 feet long, and has a total ride time of about two minutes and ten seconds. Now we’re off to our next area. This area is set to the return of Marco Polo’s return from his famous trip to China. Most of the parks’ midway games are here with a festival theme. All the rides in this area are themed around Roman mythology. There are three flat rides, a water ride, and a roller coaster in this area as well as a few small gift shops where you can purchase ride related items. 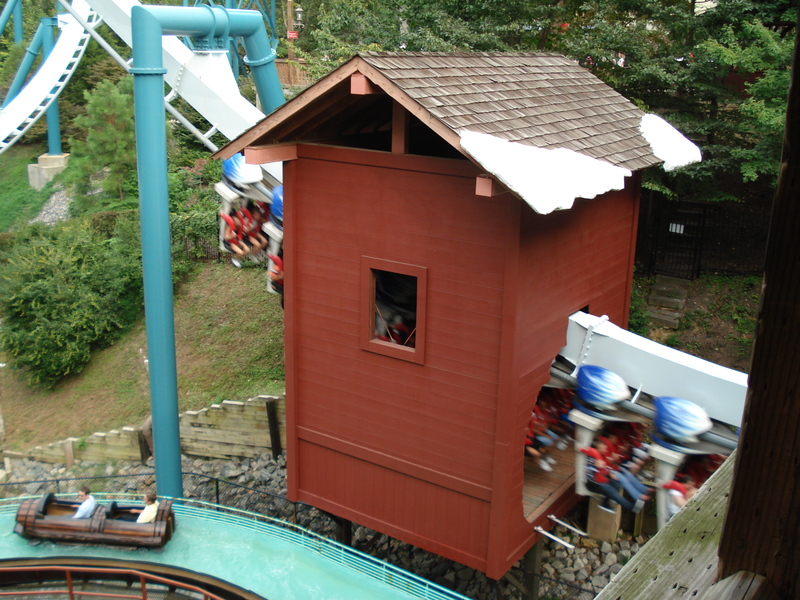 The flat rides are the Turkish Delight which is a spinning tea cups ride, Tradewinds, which is a permanent Music Express type ride, and Elephant Run, which is a kid friendly bobsled type ride. Next up is the roller coaster. 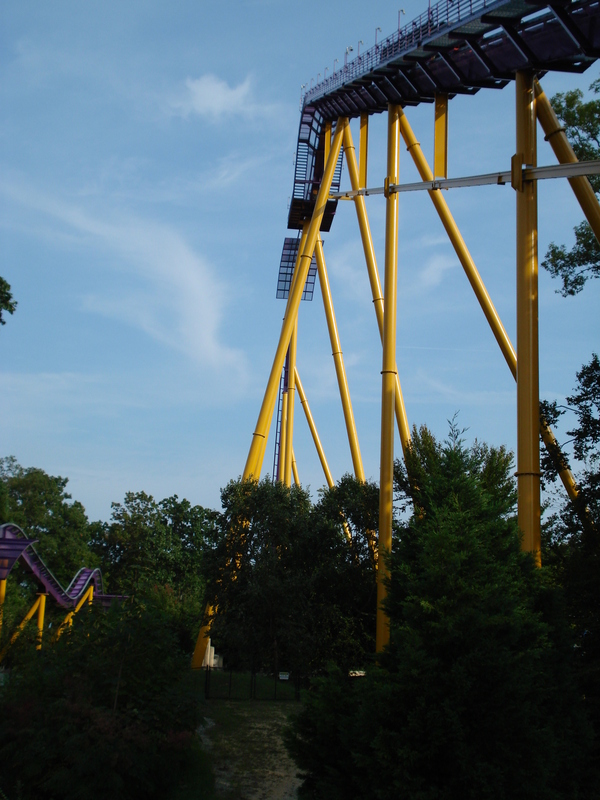 This is one of the best steel hyper coasters I’ve ridden, it ranks just below Magnum XL 200 at Cedar Point and Nitro at Six Flags Great Adventure. 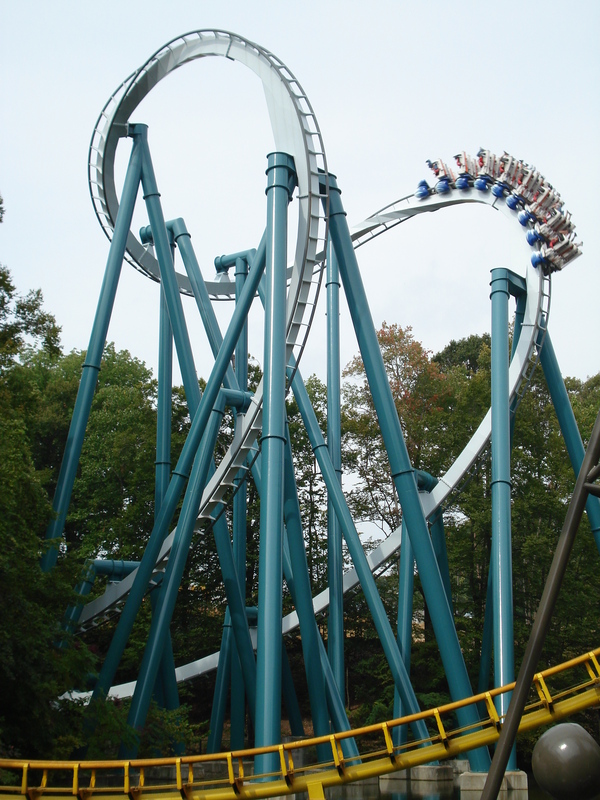 This coaster was built by B&M and opened here on March 30, 1999. 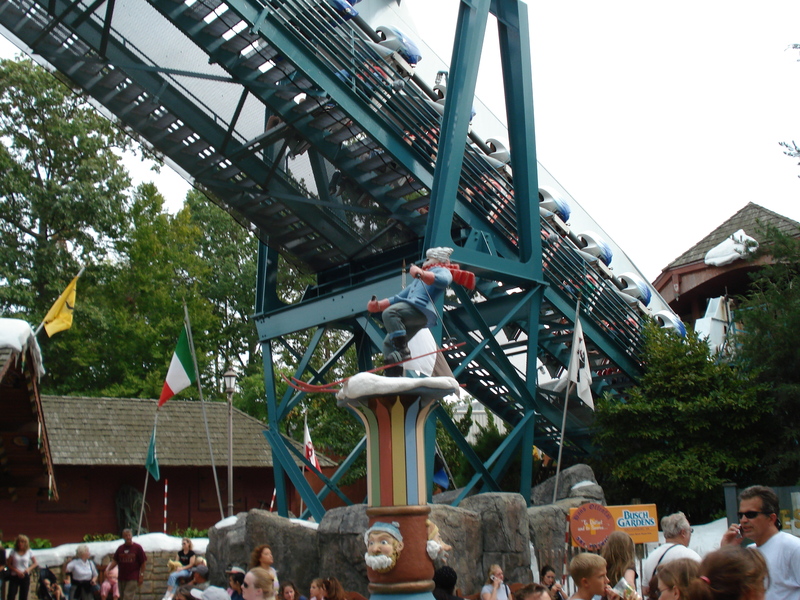 This coaster made world-wide news on opening day when Italian supermodel Fabio took the first ride and was promptly hit in the face by a goose at the bottom of the first drop. 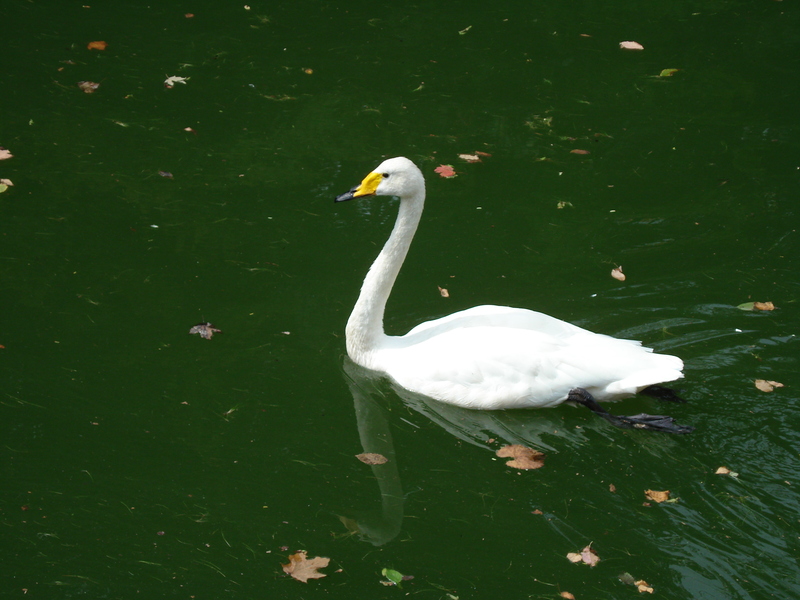 Fabio only got a few scrapes on his nose but the goose received far worse as it didn’t survive the encounter with Fabio. 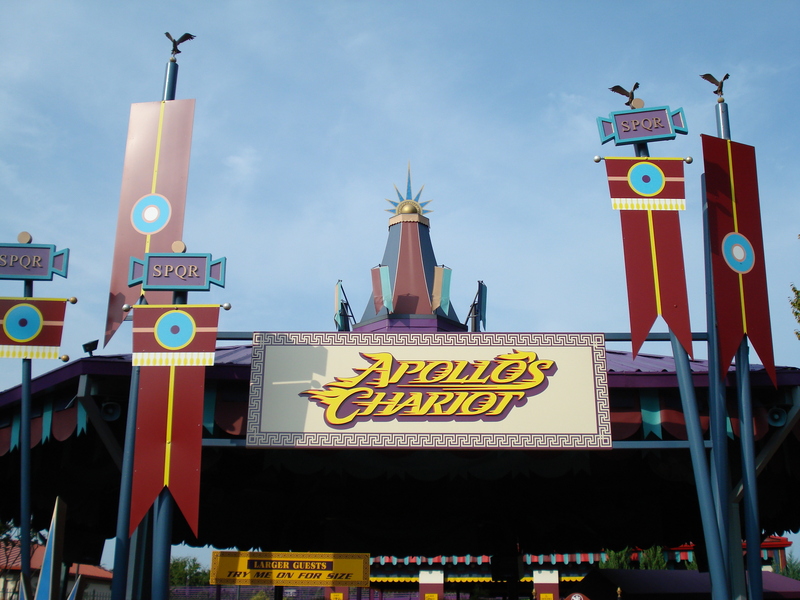 Apollo’s Chariot is 170 feet tall with a first drop of 210 feet, is 4,482 feet long, has a top speed of about 73 mph, and a ride time of about two minutes and fifteen seconds. This coaster has an enormous amount of air time which is that nice zero g feeling you get after coming over the top of a hill. I do recommend the back row to really get that air time effect. Oh by the way, you are secured by a lap bar on this coaster but don’t worry, you won’t fall out as evidenced by the millions of riders that have safely made it back to the station, including me. Here’s my off ride video of Apollo’s Chariot. Now we leave Festa Italia, cross through part of San Marco, and enter our last area. This area is just for the little ones as it is filled with rides that only the kiddies can ride or with mom or dad in tow. It opened here on April 3, 2009 and has a few gift shops, a stage for the “Sunny Days Celebration” show that features the Sesame Street characters, a few family friendly rides, and a Junior coaster. 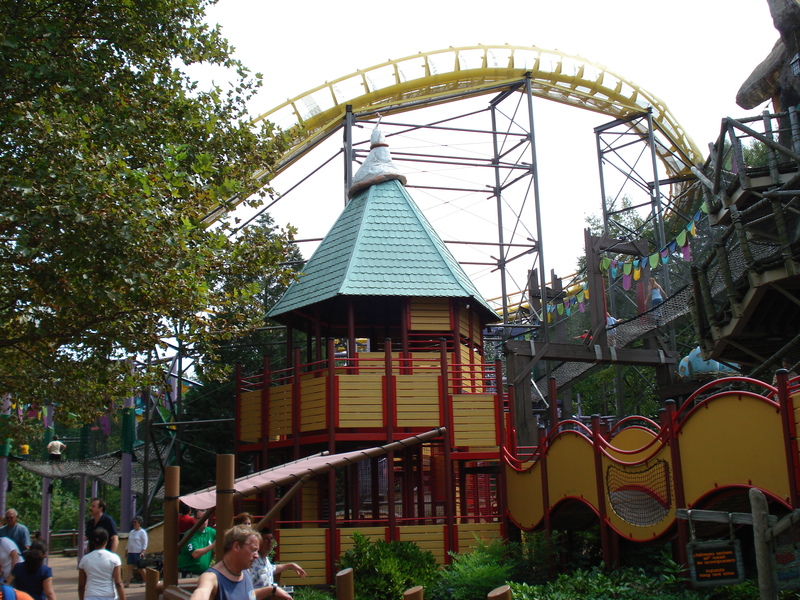 The rides include Bert and Ernie’s Loch Adventure which is a log flume ride that has water effects and doesn’t have any drops, Oscar’s Whirly Worms which is a small pirate ship style ride that slowly spins as it rocks back and forth, and Prince Elmo’s Spire which is a family friendly Shot-n-Drop tower ride from Zamperla. The family friendly junior coaster is called Grover’s Alpine Express. It is a Force 190 model from Zierer and it opened here on May 3, 2009 and stands about 24 feet high and is approximately 600 feet long. Here is an off ride view of this coaster. I hope you enjoyed reading this review and I think you’ll enjoy the many different things this park has to offer. I definitely will be making a return trip in the future.